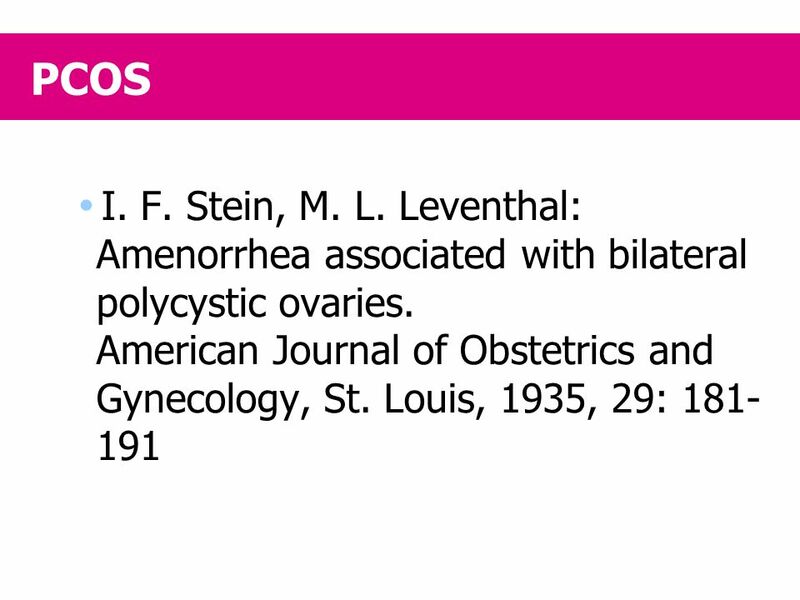 2 PCOS I. F. Stein, M. L. Leventhal: Amenorrhea associated with bilateral polycystic ovaries. American Journal of Obstetrics and Gynecology, St. Louis, 1935, 29: The nasal route of administration The nasal route represents a highly effective means of drug delivery. Intranasal drug absorption is facilitated by the highly vascularized, microvillous nature of the nasal mucosa, which provides an absorption surface estimated at 160 cm2. Each cell has about cilia and there are microvilli between the cilia which greatly increase the surface for absorption. They are covered by an hydrophilic mucus whose outer layer is relatively viscous and moves over the surface of the cilia. This mucus will trap dust and bacteria. The cilia beat with a powerful forward stroke and this rhythmic activity is responsible for the mucociliary clearance. Any drug deposited locally is therefore moved posteriorly, this antero-posterior transit time allowing local absorption, the non absorbed fraction being swallowed. Beneath the mucosa lies a complex vascular system including erectile tissue composed of sinusoids under autonomic nervous control which rapidly convey any substances absorbed across the epithelium into the systemic blood stream. Thus the absorption of drugs via a nasal route may be dependent upon the patency of the nasal airway, the retention of the drug on the mucosal surface, the mucociliary clearance function and the vascularity of the nasal mucosa. Hydrophilic substances dissolve rapidly and diffuse to the highly vascular cell lining from where they are absorbed into the general circulation. The bioavailability of a drug is also affected by factors related to the drug itself, such as molecular size and lipophilicity, and those related to the drug vehicle. Preliminary clinical experiences have documented that this route is appropriate for estrogen. The lining of the nasal cavity, showing little in the way of enzymatic function, is particularly well adapted to the absorption of products, such as estradiol, which are subjected to considerable intestinal metabolism when given orally. The nasal route is already being used with success for certain other long-term therapies eg, LHRH agonists and calcitonin. Other drugs such as insulin, vaccines, and nicotine compounds are currently under development for intranasal use. 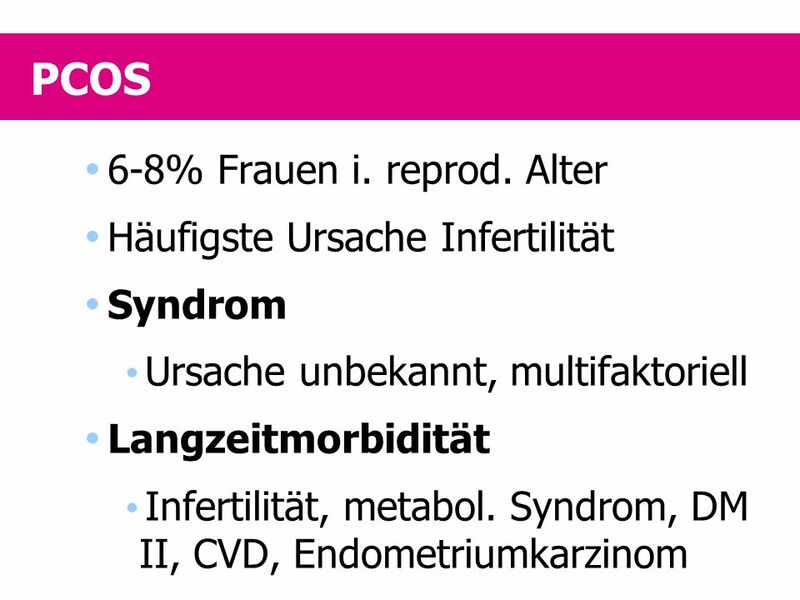 Syndrom Ursache unbekannt, multifaktoriell Langzeitmorbidität Infertilität, metabol. Syndrom, DM II, CVD, Endometriumkarzinom The nasal route of administration The nasal route represents a highly effective means of drug delivery. Intranasal drug absorption is facilitated by the highly vascularized, microvillous nature of the nasal mucosa, which provides an absorption surface estimated at 160 cm2. Each cell has about cilia and there are microvilli between the cilia which greatly increase the surface for absorption. They are covered by an hydrophilic mucus whose outer layer is relatively viscous and moves over the surface of the cilia. This mucus will trap dust and bacteria. The cilia beat with a powerful forward stroke and this rhythmic activity is responsible for the mucociliary clearance. Any drug deposited locally is therefore moved posteriorly, this antero-posterior transit time allowing local absorption, the non absorbed fraction being swallowed. Beneath the mucosa lies a complex vascular system including erectile tissue composed of sinusoids under autonomic nervous control which rapidly convey any substances absorbed across the epithelium into the systemic blood stream. Thus the absorption of drugs via a nasal route may be dependent upon the patency of the nasal airway, the retention of the drug on the mucosal surface, the mucociliary clearance function and the vascularity of the nasal mucosa. Hydrophilic substances dissolve rapidly and diffuse to the highly vascular cell lining from where they are absorbed into the general circulation. The bioavailability of a drug is also affected by factors related to the drug itself, such as molecular size and lipophilicity, and those related to the drug vehicle. Preliminary clinical experiences have documented that this route is appropriate for estrogen. The lining of the nasal cavity, showing little in the way of enzymatic function, is particularly well adapted to the absorption of products, such as estradiol, which are subjected to considerable intestinal metabolism when given orally. The nasal route is already being used with success for certain other long-term therapies eg, LHRH agonists and calcitonin. Other drugs such as insulin, vaccines, and nicotine compounds are currently under development for intranasal use. 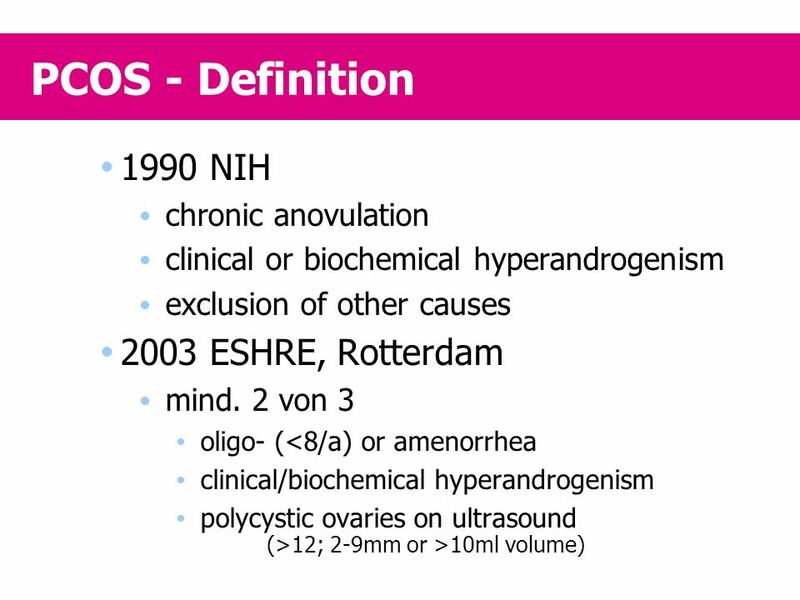 clinical or biochemical hyperandrogenism exclusion of other causes 2003 ESHRE, Rotterdam mind. 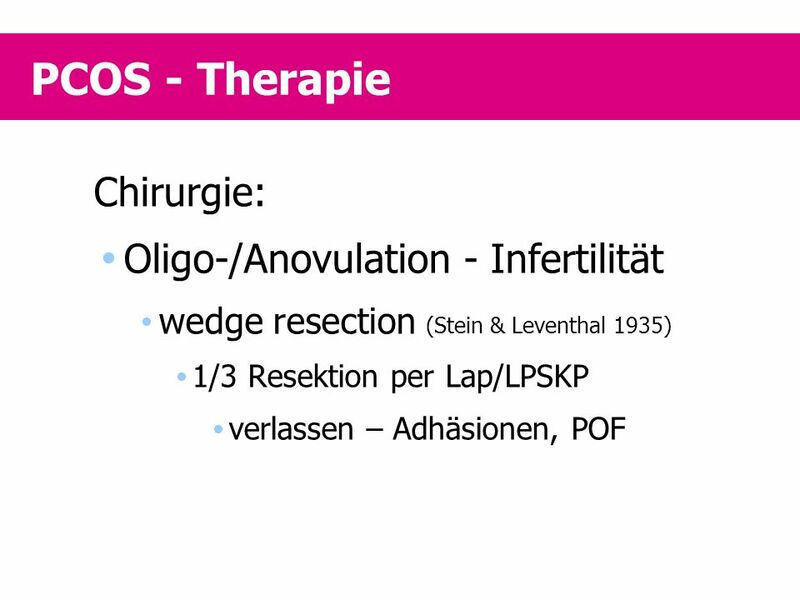 2 von 3 oligo- (<8/a) or amenorrhea clinical/biochemical hyperandrogenism polycystic ovaries on ultrasound (>12; 2-9mm or >10ml volume) The nasal route of administration The nasal route represents a highly effective means of drug delivery. Intranasal drug absorption is facilitated by the highly vascularized, microvillous nature of the nasal mucosa, which provides an absorption surface estimated at 160 cm2. Each cell has about cilia and there are microvilli between the cilia which greatly increase the surface for absorption. They are covered by an hydrophilic mucus whose outer layer is relatively viscous and moves over the surface of the cilia. This mucus will trap dust and bacteria. The cilia beat with a powerful forward stroke and this rhythmic activity is responsible for the mucociliary clearance. Any drug deposited locally is therefore moved posteriorly, this antero-posterior transit time allowing local absorption, the non absorbed fraction being swallowed. Beneath the mucosa lies a complex vascular system including erectile tissue composed of sinusoids under autonomic nervous control which rapidly convey any substances absorbed across the epithelium into the systemic blood stream. Thus the absorption of drugs via a nasal route may be dependent upon the patency of the nasal airway, the retention of the drug on the mucosal surface, the mucociliary clearance function and the vascularity of the nasal mucosa. Hydrophilic substances dissolve rapidly and diffuse to the highly vascular cell lining from where they are absorbed into the general circulation. The bioavailability of a drug is also affected by factors related to the drug itself, such as molecular size and lipophilicity, and those related to the drug vehicle. Preliminary clinical experiences have documented that this route is appropriate for estrogen. The lining of the nasal cavity, showing little in the way of enzymatic function, is particularly well adapted to the absorption of products, such as estradiol, which are subjected to considerable intestinal metabolism when given orally. The nasal route is already being used with success for certain other long-term therapies eg, LHRH agonists and calcitonin. Other drugs such as insulin, vaccines, and nicotine compounds are currently under development for intranasal use. 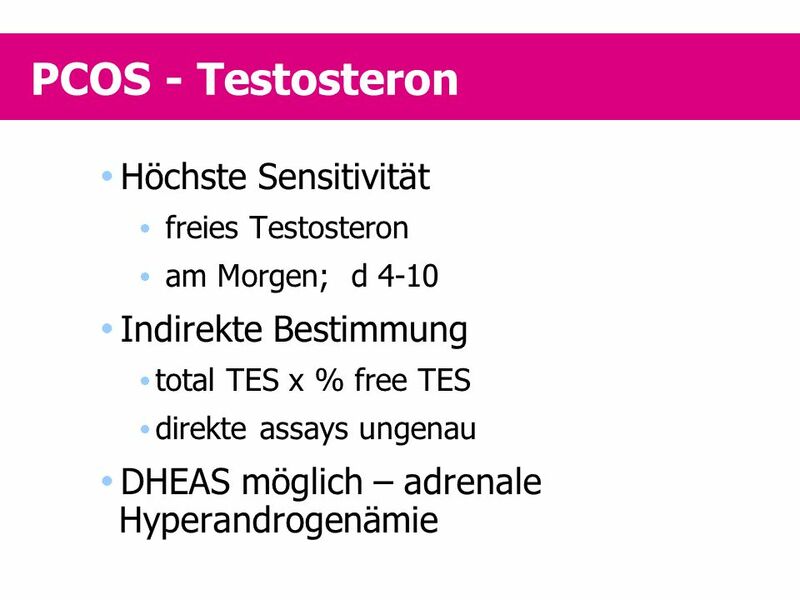 freies Testosteron am Morgen; d 4-10 Indirekte Bestimmung total TES x % free TES direkte assays ungenau DHEAS möglich – adrenale Hyperandrogenämie The nasal route of administration The nasal route represents a highly effective means of drug delivery. Intranasal drug absorption is facilitated by the highly vascularized, microvillous nature of the nasal mucosa, which provides an absorption surface estimated at 160 cm2. Each cell has about cilia and there are microvilli between the cilia which greatly increase the surface for absorption. They are covered by an hydrophilic mucus whose outer layer is relatively viscous and moves over the surface of the cilia. This mucus will trap dust and bacteria. The cilia beat with a powerful forward stroke and this rhythmic activity is responsible for the mucociliary clearance. Any drug deposited locally is therefore moved posteriorly, this antero-posterior transit time allowing local absorption, the non absorbed fraction being swallowed. Beneath the mucosa lies a complex vascular system including erectile tissue composed of sinusoids under autonomic nervous control which rapidly convey any substances absorbed across the epithelium into the systemic blood stream. Thus the absorption of drugs via a nasal route may be dependent upon the patency of the nasal airway, the retention of the drug on the mucosal surface, the mucociliary clearance function and the vascularity of the nasal mucosa. Hydrophilic substances dissolve rapidly and diffuse to the highly vascular cell lining from where they are absorbed into the general circulation. The bioavailability of a drug is also affected by factors related to the drug itself, such as molecular size and lipophilicity, and those related to the drug vehicle. Preliminary clinical experiences have documented that this route is appropriate for estrogen. The lining of the nasal cavity, showing little in the way of enzymatic function, is particularly well adapted to the absorption of products, such as estradiol, which are subjected to considerable intestinal metabolism when given orally. The nasal route is already being used with success for certain other long-term therapies eg, LHRH agonists and calcitonin. Other drugs such as insulin, vaccines, and nicotine compounds are currently under development for intranasal use. Störung auf mehreren Ebenen The nasal route of administration The nasal route represents a highly effective means of drug delivery. Intranasal drug absorption is facilitated by the highly vascularized, microvillous nature of the nasal mucosa, which provides an absorption surface estimated at 160 cm2. Each cell has about cilia and there are microvilli between the cilia which greatly increase the surface for absorption. They are covered by an hydrophilic mucus whose outer layer is relatively viscous and moves over the surface of the cilia. This mucus will trap dust and bacteria. The cilia beat with a powerful forward stroke and this rhythmic activity is responsible for the mucociliary clearance. Any drug deposited locally is therefore moved posteriorly, this antero-posterior transit time allowing local absorption, the non absorbed fraction being swallowed. Beneath the mucosa lies a complex vascular system including erectile tissue composed of sinusoids under autonomic nervous control which rapidly convey any substances absorbed across the epithelium into the systemic blood stream. Thus the absorption of drugs via a nasal route may be dependent upon the patency of the nasal airway, the retention of the drug on the mucosal surface, the mucociliary clearance function and the vascularity of the nasal mucosa. Hydrophilic substances dissolve rapidly and diffuse to the highly vascular cell lining from where they are absorbed into the general circulation. The bioavailability of a drug is also affected by factors related to the drug itself, such as molecular size and lipophilicity, and those related to the drug vehicle. Preliminary clinical experiences have documented that this route is appropriate for estrogen. The lining of the nasal cavity, showing little in the way of enzymatic function, is particularly well adapted to the absorption of products, such as estradiol, which are subjected to considerable intestinal metabolism when given orally. The nasal route is already being used with success for certain other long-term therapies eg, LHRH agonists and calcitonin. Other drugs such as insulin, vaccines, and nicotine compounds are currently under development for intranasal use. 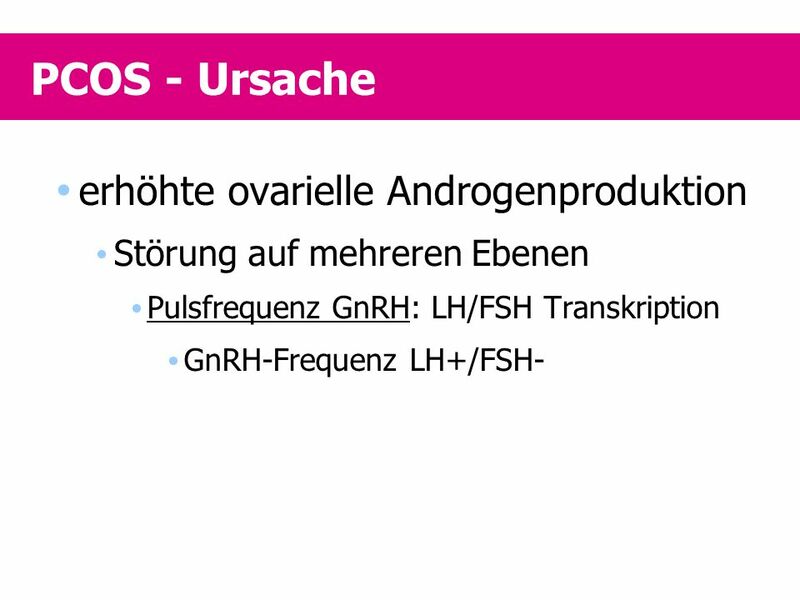 Störung auf mehreren Ebenen Pulsfrequenz GnRH: LH/FSH Transkription GnRH-Frequenz LH+/FSH- The nasal route of administration The nasal route represents a highly effective means of drug delivery. Intranasal drug absorption is facilitated by the highly vascularized, microvillous nature of the nasal mucosa, which provides an absorption surface estimated at 160 cm2. Each cell has about cilia and there are microvilli between the cilia which greatly increase the surface for absorption. They are covered by an hydrophilic mucus whose outer layer is relatively viscous and moves over the surface of the cilia. This mucus will trap dust and bacteria. The cilia beat with a powerful forward stroke and this rhythmic activity is responsible for the mucociliary clearance. Any drug deposited locally is therefore moved posteriorly, this antero-posterior transit time allowing local absorption, the non absorbed fraction being swallowed. Beneath the mucosa lies a complex vascular system including erectile tissue composed of sinusoids under autonomic nervous control which rapidly convey any substances absorbed across the epithelium into the systemic blood stream. Thus the absorption of drugs via a nasal route may be dependent upon the patency of the nasal airway, the retention of the drug on the mucosal surface, the mucociliary clearance function and the vascularity of the nasal mucosa. Hydrophilic substances dissolve rapidly and diffuse to the highly vascular cell lining from where they are absorbed into the general circulation. The bioavailability of a drug is also affected by factors related to the drug itself, such as molecular size and lipophilicity, and those related to the drug vehicle. Preliminary clinical experiences have documented that this route is appropriate for estrogen. The lining of the nasal cavity, showing little in the way of enzymatic function, is particularly well adapted to the absorption of products, such as estradiol, which are subjected to considerable intestinal metabolism when given orally. The nasal route is already being used with success for certain other long-term therapies eg, LHRH agonists and calcitonin. Other drugs such as insulin, vaccines, and nicotine compounds are currently under development for intranasal use. 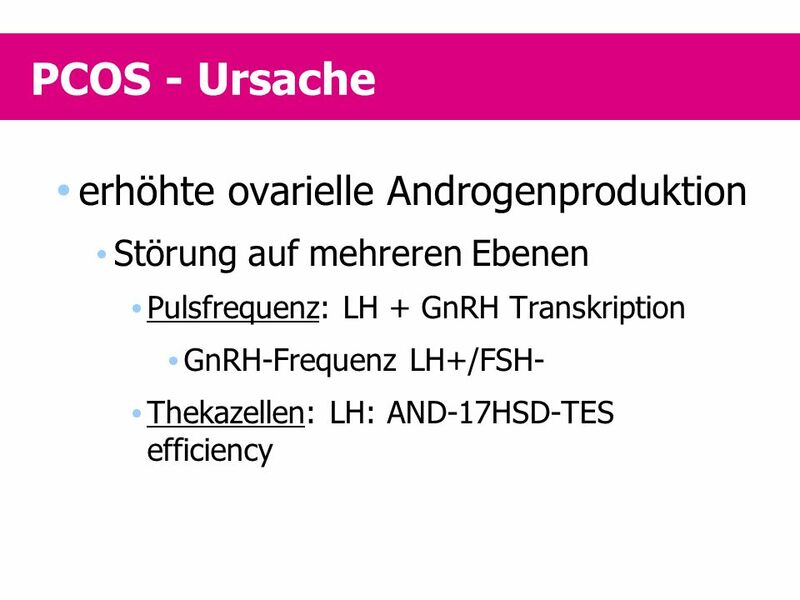 Störung auf mehreren Ebenen Pulsfrequenz: LH + GnRH Transkription GnRH-Frequenz LH+/FSH- Thekazellen: LH: AND-17HSD-TES efficiency The nasal route of administration The nasal route represents a highly effective means of drug delivery. Intranasal drug absorption is facilitated by the highly vascularized, microvillous nature of the nasal mucosa, which provides an absorption surface estimated at 160 cm2. Each cell has about cilia and there are microvilli between the cilia which greatly increase the surface for absorption. They are covered by an hydrophilic mucus whose outer layer is relatively viscous and moves over the surface of the cilia. This mucus will trap dust and bacteria. The cilia beat with a powerful forward stroke and this rhythmic activity is responsible for the mucociliary clearance. Any drug deposited locally is therefore moved posteriorly, this antero-posterior transit time allowing local absorption, the non absorbed fraction being swallowed. Beneath the mucosa lies a complex vascular system including erectile tissue composed of sinusoids under autonomic nervous control which rapidly convey any substances absorbed across the epithelium into the systemic blood stream. Thus the absorption of drugs via a nasal route may be dependent upon the patency of the nasal airway, the retention of the drug on the mucosal surface, the mucociliary clearance function and the vascularity of the nasal mucosa. Hydrophilic substances dissolve rapidly and diffuse to the highly vascular cell lining from where they are absorbed into the general circulation. The bioavailability of a drug is also affected by factors related to the drug itself, such as molecular size and lipophilicity, and those related to the drug vehicle. Preliminary clinical experiences have documented that this route is appropriate for estrogen. The lining of the nasal cavity, showing little in the way of enzymatic function, is particularly well adapted to the absorption of products, such as estradiol, which are subjected to considerable intestinal metabolism when given orally. The nasal route is already being used with success for certain other long-term therapies eg, LHRH agonists and calcitonin. Other drugs such as insulin, vaccines, and nicotine compounds are currently under development for intranasal use. 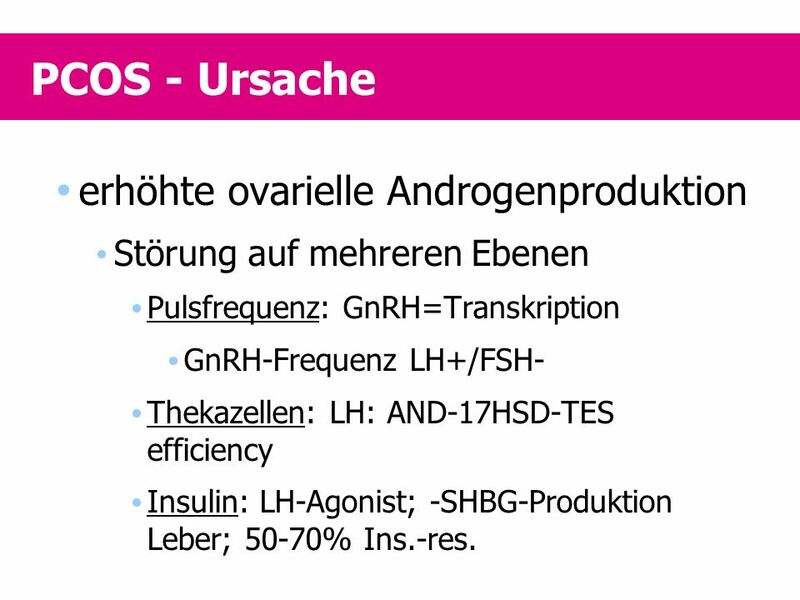 Störung auf mehreren Ebenen Pulsfrequenz: GnRH=Transkription GnRH-Frequenz LH+/FSH- Thekazellen: LH: AND-17HSD-TES efficiency Insulin: LH-Agonist; -SHBG-Produktion Leber; 50-70% Ins.-res. The nasal route of administration The nasal route represents a highly effective means of drug delivery. Intranasal drug absorption is facilitated by the highly vascularized, microvillous nature of the nasal mucosa, which provides an absorption surface estimated at 160 cm2. Each cell has about cilia and there are microvilli between the cilia which greatly increase the surface for absorption. They are covered by an hydrophilic mucus whose outer layer is relatively viscous and moves over the surface of the cilia. This mucus will trap dust and bacteria. The cilia beat with a powerful forward stroke and this rhythmic activity is responsible for the mucociliary clearance. Any drug deposited locally is therefore moved posteriorly, this antero-posterior transit time allowing local absorption, the non absorbed fraction being swallowed. Beneath the mucosa lies a complex vascular system including erectile tissue composed of sinusoids under autonomic nervous control which rapidly convey any substances absorbed across the epithelium into the systemic blood stream. Thus the absorption of drugs via a nasal route may be dependent upon the patency of the nasal airway, the retention of the drug on the mucosal surface, the mucociliary clearance function and the vascularity of the nasal mucosa. Hydrophilic substances dissolve rapidly and diffuse to the highly vascular cell lining from where they are absorbed into the general circulation. The bioavailability of a drug is also affected by factors related to the drug itself, such as molecular size and lipophilicity, and those related to the drug vehicle. Preliminary clinical experiences have documented that this route is appropriate for estrogen. The lining of the nasal cavity, showing little in the way of enzymatic function, is particularly well adapted to the absorption of products, such as estradiol, which are subjected to considerable intestinal metabolism when given orally. The nasal route is already being used with success for certain other long-term therapies eg, LHRH agonists and calcitonin. Other drugs such as insulin, vaccines, and nicotine compounds are currently under development for intranasal use. 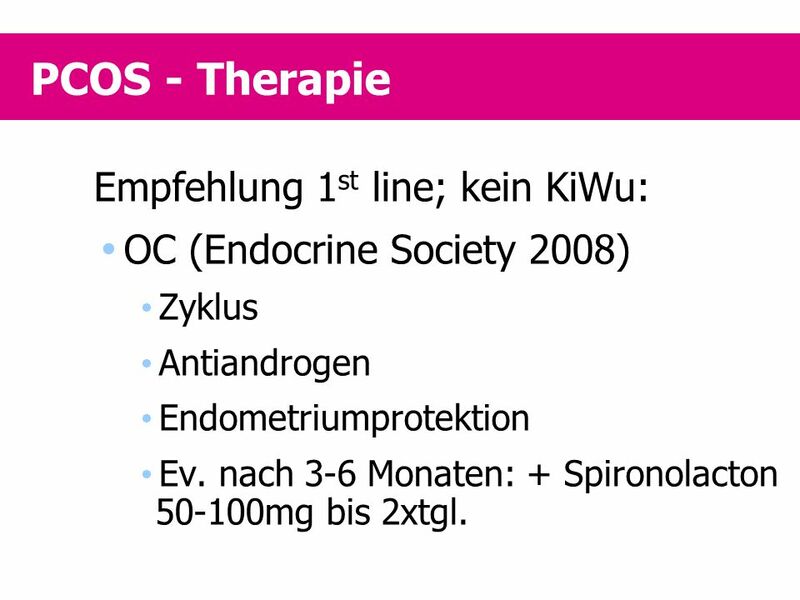 OC (Endocrine Society 2008) Zyklus Antiandrogen Endometriumprotektion Ev. nach 3-6 Monaten: + Spironolacton mg bis 2xtgl. The nasal route of administration The nasal route represents a highly effective means of drug delivery. Intranasal drug absorption is facilitated by the highly vascularized, microvillous nature of the nasal mucosa, which provides an absorption surface estimated at 160 cm2. Each cell has about cilia and there are microvilli between the cilia which greatly increase the surface for absorption. They are covered by an hydrophilic mucus whose outer layer is relatively viscous and moves over the surface of the cilia. This mucus will trap dust and bacteria. The cilia beat with a powerful forward stroke and this rhythmic activity is responsible for the mucociliary clearance. Any drug deposited locally is therefore moved posteriorly, this antero-posterior transit time allowing local absorption, the non absorbed fraction being swallowed. Beneath the mucosa lies a complex vascular system including erectile tissue composed of sinusoids under autonomic nervous control which rapidly convey any substances absorbed across the epithelium into the systemic blood stream. Thus the absorption of drugs via a nasal route may be dependent upon the patency of the nasal airway, the retention of the drug on the mucosal surface, the mucociliary clearance function and the vascularity of the nasal mucosa. Hydrophilic substances dissolve rapidly and diffuse to the highly vascular cell lining from where they are absorbed into the general circulation. The bioavailability of a drug is also affected by factors related to the drug itself, such as molecular size and lipophilicity, and those related to the drug vehicle. Preliminary clinical experiences have documented that this route is appropriate for estrogen. The lining of the nasal cavity, showing little in the way of enzymatic function, is particularly well adapted to the absorption of products, such as estradiol, which are subjected to considerable intestinal metabolism when given orally. The nasal route is already being used with success for certain other long-term therapies eg, LHRH agonists and calcitonin. Other drugs such as insulin, vaccines, and nicotine compounds are currently under development for intranasal use. wedge resection (Stein & Leventhal 1935) 1/3 Resektion per Lap/LPSKP verlassen – Adhäsionen, POF The nasal route of administration The nasal route represents a highly effective means of drug delivery. Intranasal drug absorption is facilitated by the highly vascularized, microvillous nature of the nasal mucosa, which provides an absorption surface estimated at 160 cm2. Each cell has about cilia and there are microvilli between the cilia which greatly increase the surface for absorption. They are covered by an hydrophilic mucus whose outer layer is relatively viscous and moves over the surface of the cilia. This mucus will trap dust and bacteria. The cilia beat with a powerful forward stroke and this rhythmic activity is responsible for the mucociliary clearance. Any drug deposited locally is therefore moved posteriorly, this antero-posterior transit time allowing local absorption, the non absorbed fraction being swallowed. Beneath the mucosa lies a complex vascular system including erectile tissue composed of sinusoids under autonomic nervous control which rapidly convey any substances absorbed across the epithelium into the systemic blood stream. Thus the absorption of drugs via a nasal route may be dependent upon the patency of the nasal airway, the retention of the drug on the mucosal surface, the mucociliary clearance function and the vascularity of the nasal mucosa. Hydrophilic substances dissolve rapidly and diffuse to the highly vascular cell lining from where they are absorbed into the general circulation. The bioavailability of a drug is also affected by factors related to the drug itself, such as molecular size and lipophilicity, and those related to the drug vehicle. Preliminary clinical experiences have documented that this route is appropriate for estrogen. The lining of the nasal cavity, showing little in the way of enzymatic function, is particularly well adapted to the absorption of products, such as estradiol, which are subjected to considerable intestinal metabolism when given orally. The nasal route is already being used with success for certain other long-term therapies eg, LHRH agonists and calcitonin. Other drugs such as insulin, vaccines, and nicotine compounds are currently under development for intranasal use. 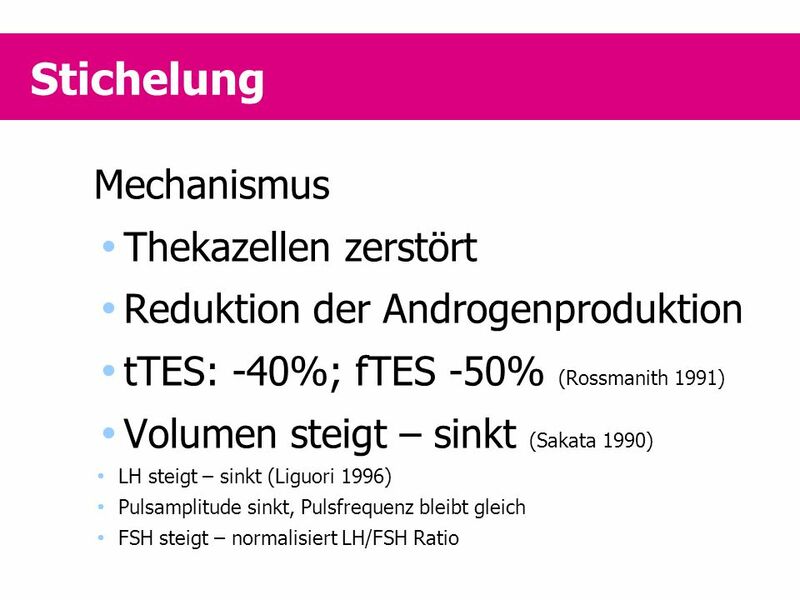 Reduktion der Androgenproduktion tTES: -40%; fTES -50% (Rossmanith 1991) Volumen steigt – sinkt (Sakata 1990) LH steigt – sinkt (Liguori 1996) Pulsamplitude sinkt, Pulsfrequenz bleibt gleich FSH steigt – normalisiert LH/FSH Ratio The nasal route of administration The nasal route represents a highly effective means of drug delivery. Intranasal drug absorption is facilitated by the highly vascularized, microvillous nature of the nasal mucosa, which provides an absorption surface estimated at 160 cm2. Each cell has about cilia and there are microvilli between the cilia which greatly increase the surface for absorption. They are covered by an hydrophilic mucus whose outer layer is relatively viscous and moves over the surface of the cilia. This mucus will trap dust and bacteria. The cilia beat with a powerful forward stroke and this rhythmic activity is responsible for the mucociliary clearance. Any drug deposited locally is therefore moved posteriorly, this antero-posterior transit time allowing local absorption, the non absorbed fraction being swallowed. Beneath the mucosa lies a complex vascular system including erectile tissue composed of sinusoids under autonomic nervous control which rapidly convey any substances absorbed across the epithelium into the systemic blood stream. Thus the absorption of drugs via a nasal route may be dependent upon the patency of the nasal airway, the retention of the drug on the mucosal surface, the mucociliary clearance function and the vascularity of the nasal mucosa. Hydrophilic substances dissolve rapidly and diffuse to the highly vascular cell lining from where they are absorbed into the general circulation. The bioavailability of a drug is also affected by factors related to the drug itself, such as molecular size and lipophilicity, and those related to the drug vehicle. Preliminary clinical experiences have documented that this route is appropriate for estrogen. The lining of the nasal cavity, showing little in the way of enzymatic function, is particularly well adapted to the absorption of products, such as estradiol, which are subjected to considerable intestinal metabolism when given orally. 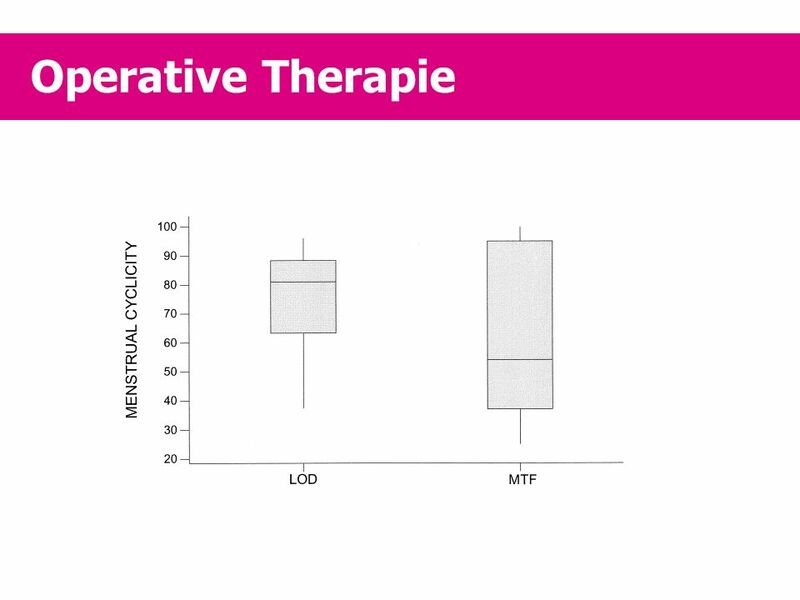 The nasal route is already being used with success for certain other long-term therapies eg, LHRH agonists and calcitonin. Other drugs such as insulin, vaccines, and nicotine compounds are currently under development for intranasal use. 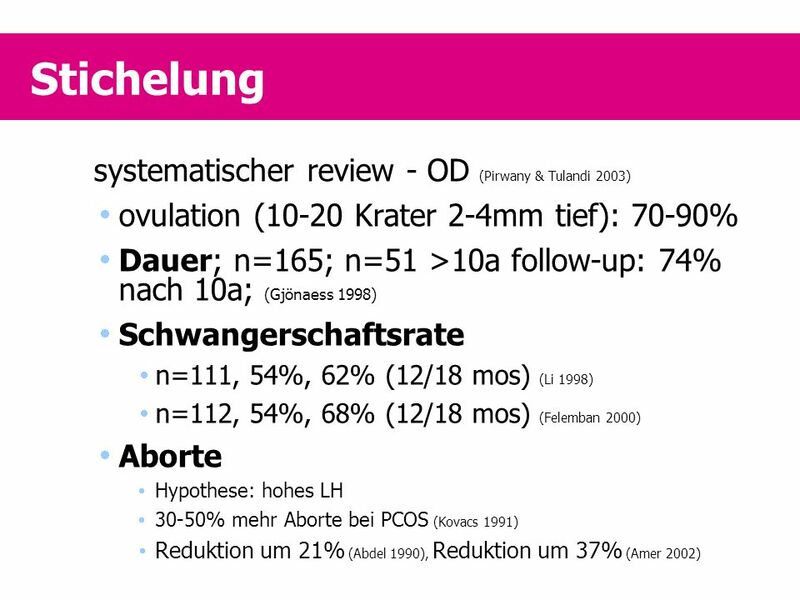 ovulation (10-20 Krater 2-4mm tief): 70-90% Dauer; n=165; n=51 >10a follow-up: 74% nach 10a; (Gjönaess 1998) Schwangerschaftsrate n=111, 54%, 62% (12/18 mos) (Li 1998) n=112, 54%, 68% (12/18 mos) (Felemban 2000) Aborte Hypothese: hohes LH 30-50% mehr Aborte bei PCOS (Kovacs 1991) Reduktion um 21% (Abdel 1990), Reduktion um 37% (Amer 2002) The nasal route of administration The nasal route represents a highly effective means of drug delivery. Intranasal drug absorption is facilitated by the highly vascularized, microvillous nature of the nasal mucosa, which provides an absorption surface estimated at 160 cm2. Each cell has about cilia and there are microvilli between the cilia which greatly increase the surface for absorption. They are covered by an hydrophilic mucus whose outer layer is relatively viscous and moves over the surface of the cilia. This mucus will trap dust and bacteria. The cilia beat with a powerful forward stroke and this rhythmic activity is responsible for the mucociliary clearance. Any drug deposited locally is therefore moved posteriorly, this antero-posterior transit time allowing local absorption, the non absorbed fraction being swallowed. Beneath the mucosa lies a complex vascular system including erectile tissue composed of sinusoids under autonomic nervous control which rapidly convey any substances absorbed across the epithelium into the systemic blood stream. Thus the absorption of drugs via a nasal route may be dependent upon the patency of the nasal airway, the retention of the drug on the mucosal surface, the mucociliary clearance function and the vascularity of the nasal mucosa. Hydrophilic substances dissolve rapidly and diffuse to the highly vascular cell lining from where they are absorbed into the general circulation. The bioavailability of a drug is also affected by factors related to the drug itself, such as molecular size and lipophilicity, and those related to the drug vehicle. Preliminary clinical experiences have documented that this route is appropriate for estrogen. The lining of the nasal cavity, showing little in the way of enzymatic function, is particularly well adapted to the absorption of products, such as estradiol, which are subjected to considerable intestinal metabolism when given orally. The nasal route is already being used with success for certain other long-term therapies eg, LHRH agonists and calcitonin. Other drugs such as insulin, vaccines, and nicotine compounds are currently under development for intranasal use. 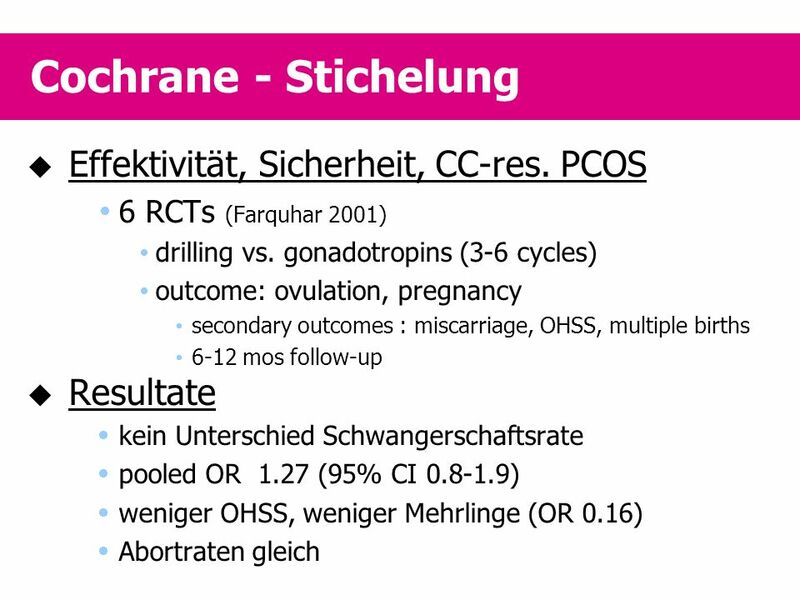 6 RCTs (Farquhar 2001) drilling vs. gonadotropins (3-6 cycles) outcome: ovulation, pregnancy secondary outcomes : miscarriage, OHSS, multiple births 6-12 mos follow-up Resultate kein Unterschied Schwangerschaftsrate pooled OR (95% CI ) weniger OHSS, weniger Mehrlinge (OR 0.16) Abortraten gleich The nasal route of administration The nasal route represents a highly effective means of drug delivery. Intranasal drug absorption is facilitated by the highly vascularized, microvillous nature of the nasal mucosa, which provides an absorption surface estimated at 160 cm2. Each cell has about cilia and there are microvilli between the cilia which greatly increase the surface for absorption. They are covered by an hydrophilic mucus whose outer layer is relatively viscous and moves over the surface of the cilia. This mucus will trap dust and bacteria. The cilia beat with a powerful forward stroke and this rhythmic activity is responsible for the mucociliary clearance. Any drug deposited locally is therefore moved posteriorly, this antero-posterior transit time allowing local absorption, the non absorbed fraction being swallowed. Beneath the mucosa lies a complex vascular system including erectile tissue composed of sinusoids under autonomic nervous control which rapidly convey any substances absorbed across the epithelium into the systemic blood stream. Thus the absorption of drugs via a nasal route may be dependent upon the patency of the nasal airway, the retention of the drug on the mucosal surface, the mucociliary clearance function and the vascularity of the nasal mucosa. Hydrophilic substances dissolve rapidly and diffuse to the highly vascular cell lining from where they are absorbed into the general circulation. The bioavailability of a drug is also affected by factors related to the drug itself, such as molecular size and lipophilicity, and those related to the drug vehicle. Preliminary clinical experiences have documented that this route is appropriate for estrogen. The lining of the nasal cavity, showing little in the way of enzymatic function, is particularly well adapted to the absorption of products, such as estradiol, which are subjected to considerable intestinal metabolism when given orally. The nasal route is already being used with success for certain other long-term therapies eg, LHRH agonists and calcitonin. Other drugs such as insulin, vaccines, and nicotine compounds are currently under development for intranasal use. Met, Piogl., Rosigl., D-chiro-In. 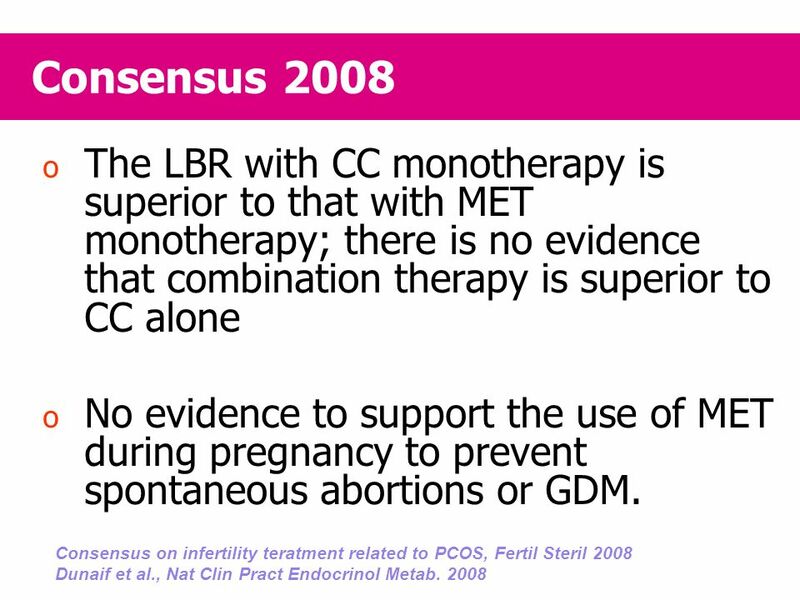 15 RCTs; 13 Met. 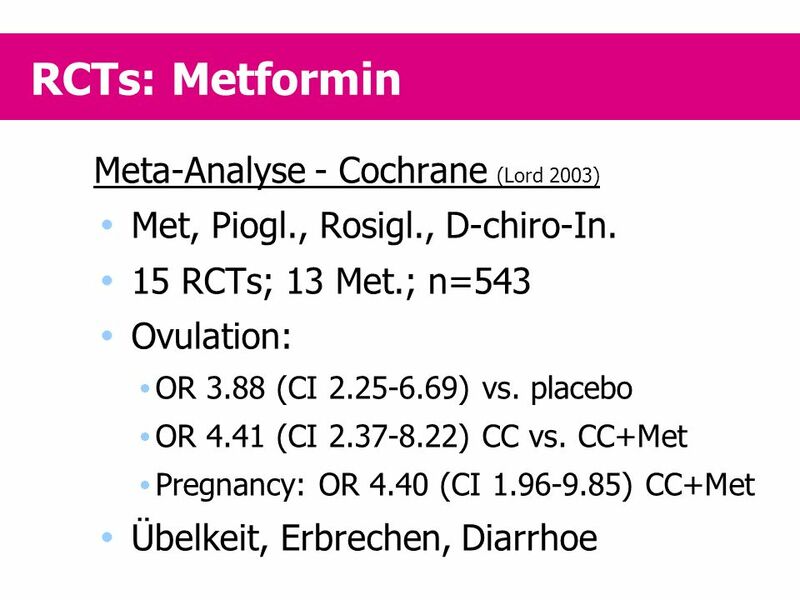 ; n=543 Ovulation: OR 3.88 (CI ) vs. placebo OR 4.41 (CI ) CC vs. CC+Met Pregnancy: OR 4.40 (CI ) CC+Met Übelkeit, Erbrechen, Diarrhoe The nasal route of administration The nasal route represents a highly effective means of drug delivery. Intranasal drug absorption is facilitated by the highly vascularized, microvillous nature of the nasal mucosa, which provides an absorption surface estimated at 160 cm2. Each cell has about cilia and there are microvilli between the cilia which greatly increase the surface for absorption. They are covered by an hydrophilic mucus whose outer layer is relatively viscous and moves over the surface of the cilia. This mucus will trap dust and bacteria. The cilia beat with a powerful forward stroke and this rhythmic activity is responsible for the mucociliary clearance. Any drug deposited locally is therefore moved posteriorly, this antero-posterior transit time allowing local absorption, the non absorbed fraction being swallowed. Beneath the mucosa lies a complex vascular system including erectile tissue composed of sinusoids under autonomic nervous control which rapidly convey any substances absorbed across the epithelium into the systemic blood stream. Thus the absorption of drugs via a nasal route may be dependent upon the patency of the nasal airway, the retention of the drug on the mucosal surface, the mucociliary clearance function and the vascularity of the nasal mucosa. Hydrophilic substances dissolve rapidly and diffuse to the highly vascular cell lining from where they are absorbed into the general circulation. The bioavailability of a drug is also affected by factors related to the drug itself, such as molecular size and lipophilicity, and those related to the drug vehicle. Preliminary clinical experiences have documented that this route is appropriate for estrogen. The lining of the nasal cavity, showing little in the way of enzymatic function, is particularly well adapted to the absorption of products, such as estradiol, which are subjected to considerable intestinal metabolism when given orally. The nasal route is already being used with success for certain other long-term therapies eg, LHRH agonists and calcitonin. Other drugs such as insulin, vaccines, and nicotine compounds are currently under development for intranasal use. n=111; 55% + CC (6 mos) (Vandermolen 2001) Aborte n=65; prosp., non-rand. 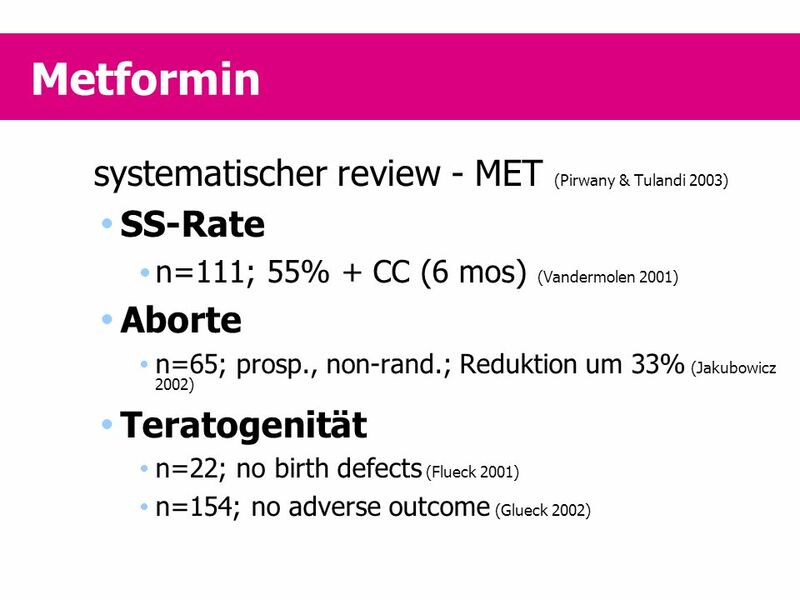 ; Reduktion um 33% (Jakubowicz 2002) Teratogenität n=22; no birth defects (Flueck 2001) n=154; no adverse outcome (Glueck 2002) The nasal route of administration The nasal route represents a highly effective means of drug delivery. Intranasal drug absorption is facilitated by the highly vascularized, microvillous nature of the nasal mucosa, which provides an absorption surface estimated at 160 cm2. Each cell has about cilia and there are microvilli between the cilia which greatly increase the surface for absorption. They are covered by an hydrophilic mucus whose outer layer is relatively viscous and moves over the surface of the cilia. This mucus will trap dust and bacteria. The cilia beat with a powerful forward stroke and this rhythmic activity is responsible for the mucociliary clearance. Any drug deposited locally is therefore moved posteriorly, this antero-posterior transit time allowing local absorption, the non absorbed fraction being swallowed. Beneath the mucosa lies a complex vascular system including erectile tissue composed of sinusoids under autonomic nervous control which rapidly convey any substances absorbed across the epithelium into the systemic blood stream. Thus the absorption of drugs via a nasal route may be dependent upon the patency of the nasal airway, the retention of the drug on the mucosal surface, the mucociliary clearance function and the vascularity of the nasal mucosa. Hydrophilic substances dissolve rapidly and diffuse to the highly vascular cell lining from where they are absorbed into the general circulation. The bioavailability of a drug is also affected by factors related to the drug itself, such as molecular size and lipophilicity, and those related to the drug vehicle. Preliminary clinical experiences have documented that this route is appropriate for estrogen. The lining of the nasal cavity, showing little in the way of enzymatic function, is particularly well adapted to the absorption of products, such as estradiol, which are subjected to considerable intestinal metabolism when given orally. The nasal route is already being used with success for certain other long-term therapies eg, LHRH agonists and calcitonin. Other drugs such as insulin, vaccines, and nicotine compounds are currently under development for intranasal use. 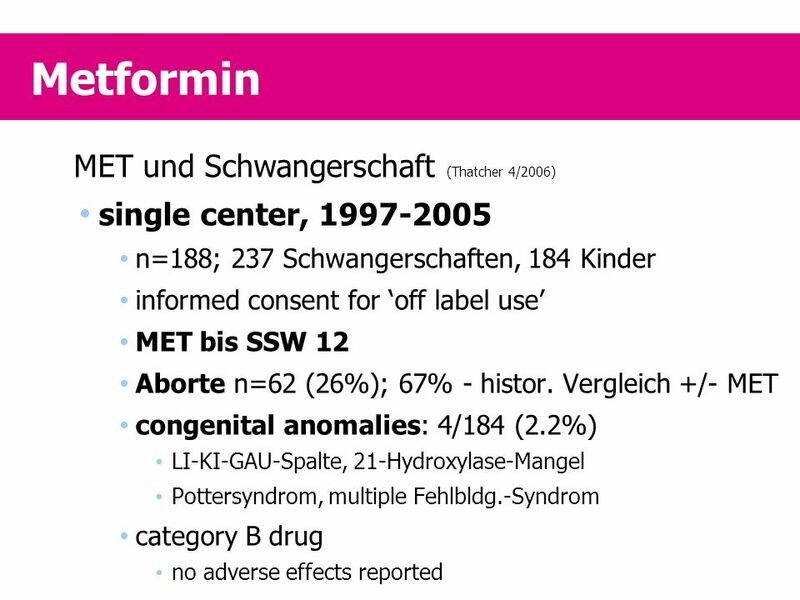 single center, n=188; 237 Schwangerschaften, 184 Kinder informed consent for ‘off label use’ MET bis SSW 12 Aborte n=62 (26%); 67% - histor. 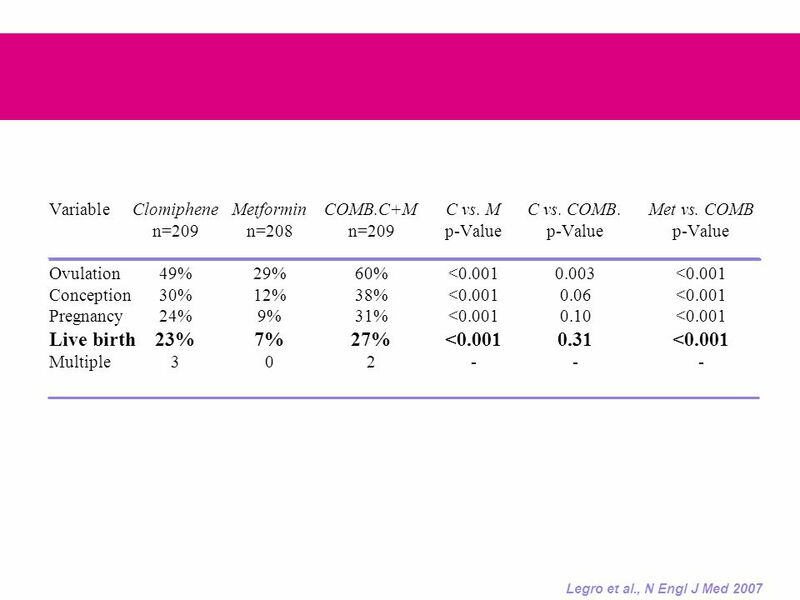 Vergleich +/- MET congenital anomalies: 4/184 (2.2%) LI-KI-GAU-Spalte, 21-Hydroxylase-Mangel Pottersyndrom, multiple Fehlbldg.-Syndrom category B drug no adverse effects reported The nasal route of administration The nasal route represents a highly effective means of drug delivery. Intranasal drug absorption is facilitated by the highly vascularized, microvillous nature of the nasal mucosa, which provides an absorption surface estimated at 160 cm2. Each cell has about cilia and there are microvilli between the cilia which greatly increase the surface for absorption. They are covered by an hydrophilic mucus whose outer layer is relatively viscous and moves over the surface of the cilia. This mucus will trap dust and bacteria. The cilia beat with a powerful forward stroke and this rhythmic activity is responsible for the mucociliary clearance. Any drug deposited locally is therefore moved posteriorly, this antero-posterior transit time allowing local absorption, the non absorbed fraction being swallowed. Beneath the mucosa lies a complex vascular system including erectile tissue composed of sinusoids under autonomic nervous control which rapidly convey any substances absorbed across the epithelium into the systemic blood stream. Thus the absorption of drugs via a nasal route may be dependent upon the patency of the nasal airway, the retention of the drug on the mucosal surface, the mucociliary clearance function and the vascularity of the nasal mucosa. Hydrophilic substances dissolve rapidly and diffuse to the highly vascular cell lining from where they are absorbed into the general circulation. The bioavailability of a drug is also affected by factors related to the drug itself, such as molecular size and lipophilicity, and those related to the drug vehicle. Preliminary clinical experiences have documented that this route is appropriate for estrogen. The lining of the nasal cavity, showing little in the way of enzymatic function, is particularly well adapted to the absorption of products, such as estradiol, which are subjected to considerable intestinal metabolism when given orally. The nasal route is already being used with success for certain other long-term therapies eg, LHRH agonists and calcitonin. Other drugs such as insulin, vaccines, and nicotine compounds are currently under development for intranasal use. 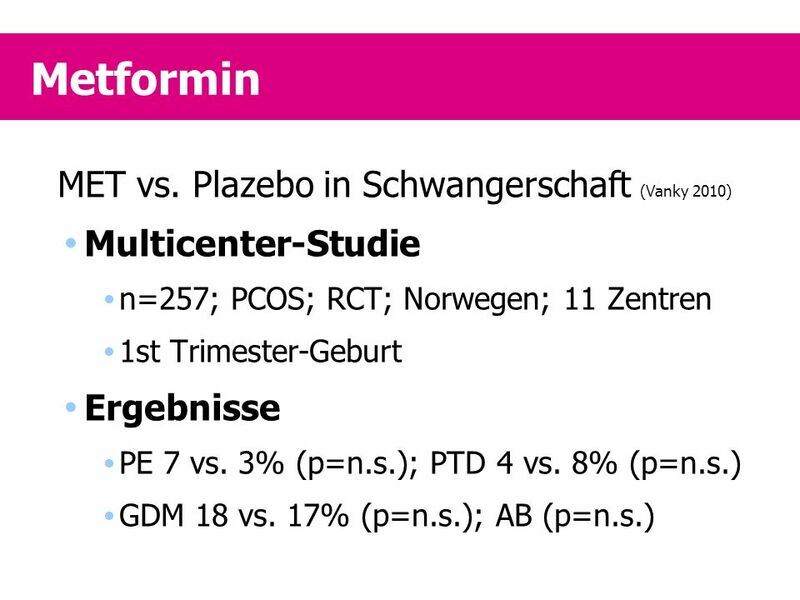 Multicenter-Studie n=257; PCOS; RCT; Norwegen; 11 Zentren 1st Trimester-Geburt Ergebnisse PE 7 vs. 3% (p=n.s. ); PTD 4 vs. 8% (p=n.s.) GDM 18 vs. 17% (p=n.s. ); AB (p=n.s.) The nasal route of administration The nasal route represents a highly effective means of drug delivery. Intranasal drug absorption is facilitated by the highly vascularized, microvillous nature of the nasal mucosa, which provides an absorption surface estimated at 160 cm2. Each cell has about cilia and there are microvilli between the cilia which greatly increase the surface for absorption. They are covered by an hydrophilic mucus whose outer layer is relatively viscous and moves over the surface of the cilia. This mucus will trap dust and bacteria. The cilia beat with a powerful forward stroke and this rhythmic activity is responsible for the mucociliary clearance. Any drug deposited locally is therefore moved posteriorly, this antero-posterior transit time allowing local absorption, the non absorbed fraction being swallowed. Beneath the mucosa lies a complex vascular system including erectile tissue composed of sinusoids under autonomic nervous control which rapidly convey any substances absorbed across the epithelium into the systemic blood stream. Thus the absorption of drugs via a nasal route may be dependent upon the patency of the nasal airway, the retention of the drug on the mucosal surface, the mucociliary clearance function and the vascularity of the nasal mucosa. Hydrophilic substances dissolve rapidly and diffuse to the highly vascular cell lining from where they are absorbed into the general circulation. The bioavailability of a drug is also affected by factors related to the drug itself, such as molecular size and lipophilicity, and those related to the drug vehicle. Preliminary clinical experiences have documented that this route is appropriate for estrogen. The lining of the nasal cavity, showing little in the way of enzymatic function, is particularly well adapted to the absorption of products, such as estradiol, which are subjected to considerable intestinal metabolism when given orally. The nasal route is already being used with success for certain other long-term therapies eg, LHRH agonists and calcitonin. Other drugs such as insulin, vaccines, and nicotine compounds are currently under development for intranasal use. 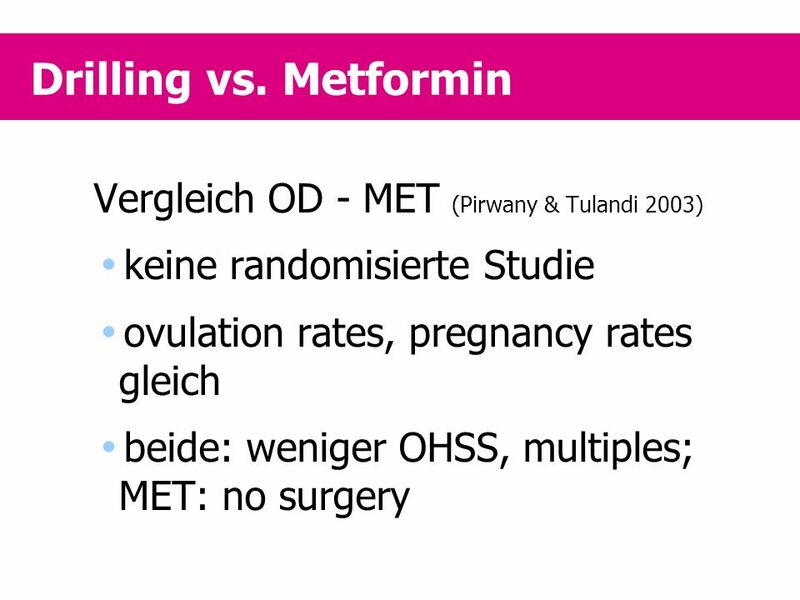 Effect in lean and obese women MET sign. 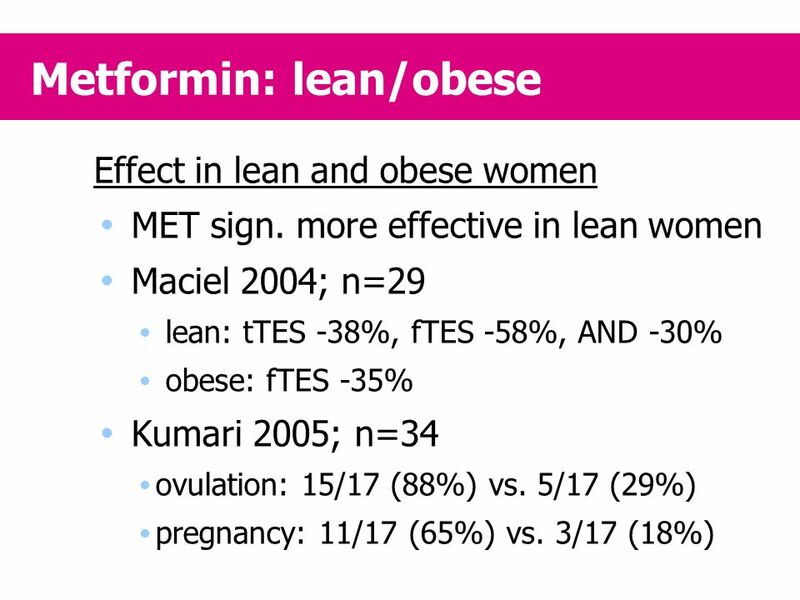 more effective in lean women Maciel 2004; n=29 lean: tTES -38%, fTES -58%, AND -30% obese: fTES -35% Kumari 2005; n=34 ovulation: 15/17 (88%) vs. 5/17 (29%) pregnancy: 11/17 (65%) vs. 3/17 (18%) The nasal route of administration The nasal route represents a highly effective means of drug delivery. Intranasal drug absorption is facilitated by the highly vascularized, microvillous nature of the nasal mucosa, which provides an absorption surface estimated at 160 cm2. Each cell has about cilia and there are microvilli between the cilia which greatly increase the surface for absorption. They are covered by an hydrophilic mucus whose outer layer is relatively viscous and moves over the surface of the cilia. This mucus will trap dust and bacteria. The cilia beat with a powerful forward stroke and this rhythmic activity is responsible for the mucociliary clearance. Any drug deposited locally is therefore moved posteriorly, this antero-posterior transit time allowing local absorption, the non absorbed fraction being swallowed. Beneath the mucosa lies a complex vascular system including erectile tissue composed of sinusoids under autonomic nervous control which rapidly convey any substances absorbed across the epithelium into the systemic blood stream. Thus the absorption of drugs via a nasal route may be dependent upon the patency of the nasal airway, the retention of the drug on the mucosal surface, the mucociliary clearance function and the vascularity of the nasal mucosa. Hydrophilic substances dissolve rapidly and diffuse to the highly vascular cell lining from where they are absorbed into the general circulation. The bioavailability of a drug is also affected by factors related to the drug itself, such as molecular size and lipophilicity, and those related to the drug vehicle. Preliminary clinical experiences have documented that this route is appropriate for estrogen. The lining of the nasal cavity, showing little in the way of enzymatic function, is particularly well adapted to the absorption of products, such as estradiol, which are subjected to considerable intestinal metabolism when given orally. The nasal route is already being used with success for certain other long-term therapies eg, LHRH agonists and calcitonin. Other drugs such as insulin, vaccines, and nicotine compounds are currently under development for intranasal use. 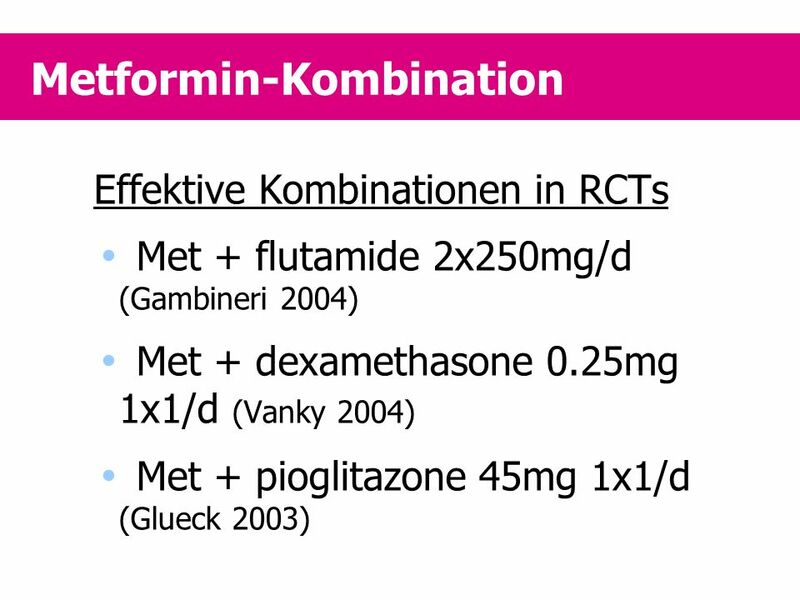 Effektive Kombinationen in RCTs Met + flutamide 2x250mg/d (Gambineri 2004) Met + dexamethasone 0.25mg 1x1/d (Vanky 2004) Met + pioglitazone 45mg 1x1/d (Glueck 2003) The nasal route of administration The nasal route represents a highly effective means of drug delivery. Intranasal drug absorption is facilitated by the highly vascularized, microvillous nature of the nasal mucosa, which provides an absorption surface estimated at 160 cm2. Each cell has about cilia and there are microvilli between the cilia which greatly increase the surface for absorption. They are covered by an hydrophilic mucus whose outer layer is relatively viscous and moves over the surface of the cilia. This mucus will trap dust and bacteria. The cilia beat with a powerful forward stroke and this rhythmic activity is responsible for the mucociliary clearance. Any drug deposited locally is therefore moved posteriorly, this antero-posterior transit time allowing local absorption, the non absorbed fraction being swallowed. Beneath the mucosa lies a complex vascular system including erectile tissue composed of sinusoids under autonomic nervous control which rapidly convey any substances absorbed across the epithelium into the systemic blood stream. Thus the absorption of drugs via a nasal route may be dependent upon the patency of the nasal airway, the retention of the drug on the mucosal surface, the mucociliary clearance function and the vascularity of the nasal mucosa. Hydrophilic substances dissolve rapidly and diffuse to the highly vascular cell lining from where they are absorbed into the general circulation. The bioavailability of a drug is also affected by factors related to the drug itself, such as molecular size and lipophilicity, and those related to the drug vehicle. Preliminary clinical experiences have documented that this route is appropriate for estrogen. The lining of the nasal cavity, showing little in the way of enzymatic function, is particularly well adapted to the absorption of products, such as estradiol, which are subjected to considerable intestinal metabolism when given orally. The nasal route is already being used with success for certain other long-term therapies eg, LHRH agonists and calcitonin. Other drugs such as insulin, vaccines, and nicotine compounds are currently under development for intranasal use. 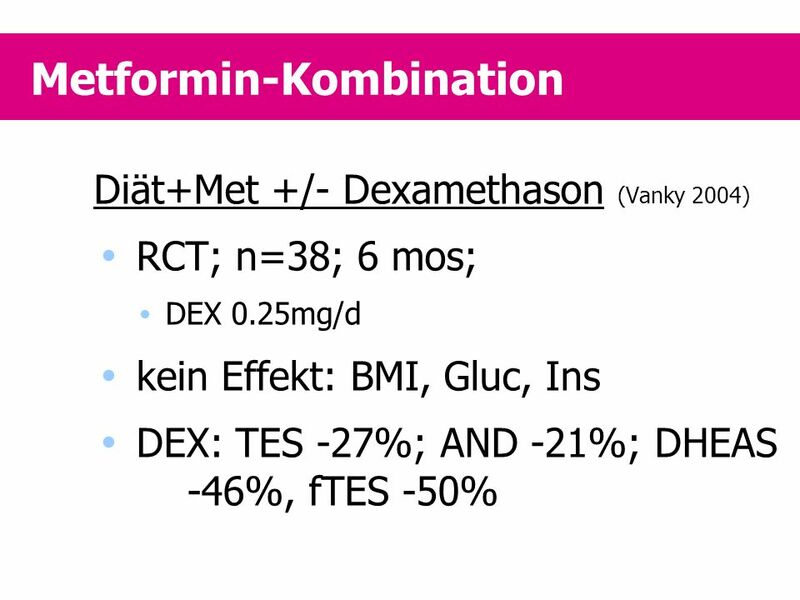 Diät+Met +/- Dexamethason (Vanky 2004) RCT; n=38; 6 mos; DEX 0.25mg/d kein Effekt: BMI, Gluc, Ins DEX: TES -27%; AND -21%; DHEAS -46%, fTES -50% The nasal route of administration The nasal route represents a highly effective means of drug delivery. Intranasal drug absorption is facilitated by the highly vascularized, microvillous nature of the nasal mucosa, which provides an absorption surface estimated at 160 cm2. Each cell has about cilia and there are microvilli between the cilia which greatly increase the surface for absorption. They are covered by an hydrophilic mucus whose outer layer is relatively viscous and moves over the surface of the cilia. This mucus will trap dust and bacteria. The cilia beat with a powerful forward stroke and this rhythmic activity is responsible for the mucociliary clearance. Any drug deposited locally is therefore moved posteriorly, this antero-posterior transit time allowing local absorption, the non absorbed fraction being swallowed. Beneath the mucosa lies a complex vascular system including erectile tissue composed of sinusoids under autonomic nervous control which rapidly convey any substances absorbed across the epithelium into the systemic blood stream. Thus the absorption of drugs via a nasal route may be dependent upon the patency of the nasal airway, the retention of the drug on the mucosal surface, the mucociliary clearance function and the vascularity of the nasal mucosa. Hydrophilic substances dissolve rapidly and diffuse to the highly vascular cell lining from where they are absorbed into the general circulation. The bioavailability of a drug is also affected by factors related to the drug itself, such as molecular size and lipophilicity, and those related to the drug vehicle. Preliminary clinical experiences have documented that this route is appropriate for estrogen. The lining of the nasal cavity, showing little in the way of enzymatic function, is particularly well adapted to the absorption of products, such as estradiol, which are subjected to considerable intestinal metabolism when given orally. The nasal route is already being used with success for certain other long-term therapies eg, LHRH agonists and calcitonin. Other drugs such as insulin, vaccines, and nicotine compounds are currently under development for intranasal use. 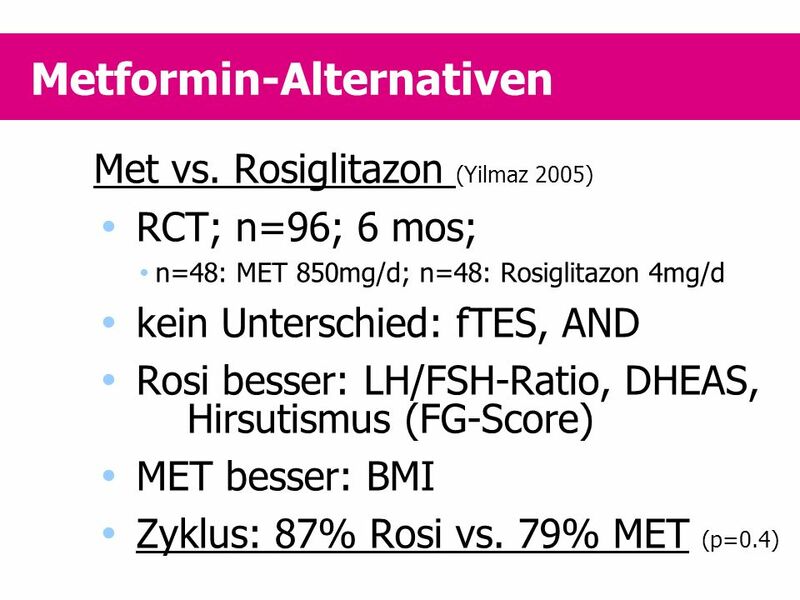 Met vs. Rosiglitazon (Yilmaz 2005) RCT; n=96; 6 mos; n=48: MET 850mg/d; n=48: Rosiglitazon 4mg/d kein Unterschied: fTES, AND Rosi besser: LH/FSH-Ratio, DHEAS, Hirsutismus (FG-Score) MET besser: BMI Zyklus: 87% Rosi vs. 79% MET (p=0.4) The nasal route of administration The nasal route represents a highly effective means of drug delivery. Intranasal drug absorption is facilitated by the highly vascularized, microvillous nature of the nasal mucosa, which provides an absorption surface estimated at 160 cm2. Each cell has about cilia and there are microvilli between the cilia which greatly increase the surface for absorption. They are covered by an hydrophilic mucus whose outer layer is relatively viscous and moves over the surface of the cilia. This mucus will trap dust and bacteria. The cilia beat with a powerful forward stroke and this rhythmic activity is responsible for the mucociliary clearance. Any drug deposited locally is therefore moved posteriorly, this antero-posterior transit time allowing local absorption, the non absorbed fraction being swallowed. Beneath the mucosa lies a complex vascular system including erectile tissue composed of sinusoids under autonomic nervous control which rapidly convey any substances absorbed across the epithelium into the systemic blood stream. Thus the absorption of drugs via a nasal route may be dependent upon the patency of the nasal airway, the retention of the drug on the mucosal surface, the mucociliary clearance function and the vascularity of the nasal mucosa. Hydrophilic substances dissolve rapidly and diffuse to the highly vascular cell lining from where they are absorbed into the general circulation. The bioavailability of a drug is also affected by factors related to the drug itself, such as molecular size and lipophilicity, and those related to the drug vehicle. Preliminary clinical experiences have documented that this route is appropriate for estrogen. The lining of the nasal cavity, showing little in the way of enzymatic function, is particularly well adapted to the absorption of products, such as estradiol, which are subjected to considerable intestinal metabolism when given orally. The nasal route is already being used with success for certain other long-term therapies eg, LHRH agonists and calcitonin. Other drugs such as insulin, vaccines, and nicotine compounds are currently under development for intranasal use. 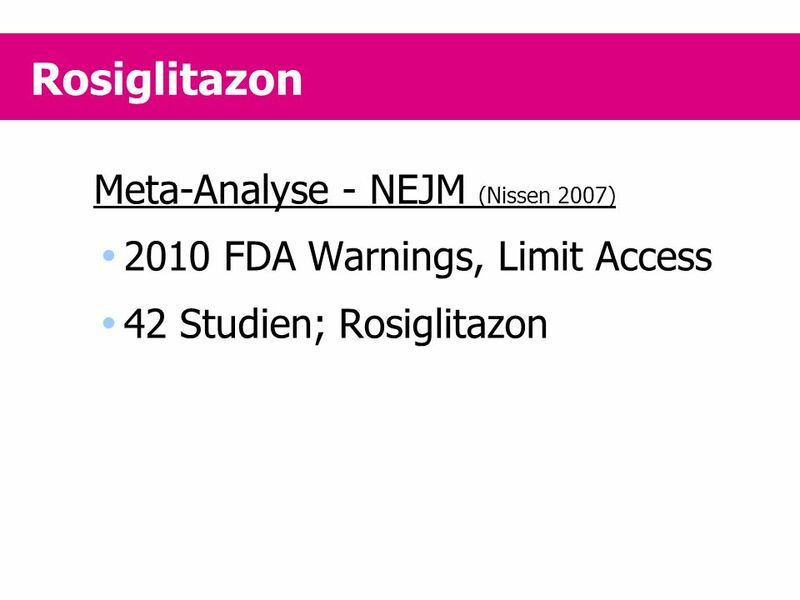 2010 FDA Warnings, Limit Access 42 Studien; Rosiglitazon The nasal route of administration The nasal route represents a highly effective means of drug delivery. Intranasal drug absorption is facilitated by the highly vascularized, microvillous nature of the nasal mucosa, which provides an absorption surface estimated at 160 cm2. Each cell has about cilia and there are microvilli between the cilia which greatly increase the surface for absorption. They are covered by an hydrophilic mucus whose outer layer is relatively viscous and moves over the surface of the cilia. This mucus will trap dust and bacteria. The cilia beat with a powerful forward stroke and this rhythmic activity is responsible for the mucociliary clearance. Any drug deposited locally is therefore moved posteriorly, this antero-posterior transit time allowing local absorption, the non absorbed fraction being swallowed. Beneath the mucosa lies a complex vascular system including erectile tissue composed of sinusoids under autonomic nervous control which rapidly convey any substances absorbed across the epithelium into the systemic blood stream. Thus the absorption of drugs via a nasal route may be dependent upon the patency of the nasal airway, the retention of the drug on the mucosal surface, the mucociliary clearance function and the vascularity of the nasal mucosa. Hydrophilic substances dissolve rapidly and diffuse to the highly vascular cell lining from where they are absorbed into the general circulation. The bioavailability of a drug is also affected by factors related to the drug itself, such as molecular size and lipophilicity, and those related to the drug vehicle. Preliminary clinical experiences have documented that this route is appropriate for estrogen. The lining of the nasal cavity, showing little in the way of enzymatic function, is particularly well adapted to the absorption of products, such as estradiol, which are subjected to considerable intestinal metabolism when given orally. The nasal route is already being used with success for certain other long-term therapies eg, LHRH agonists and calcitonin. Other drugs such as insulin, vaccines, and nicotine compounds are currently under development for intranasal use. 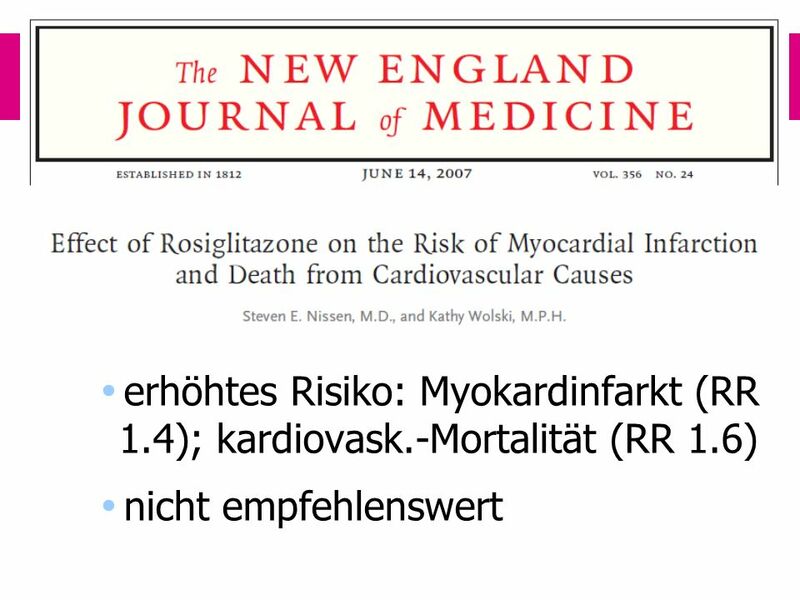 24 Rosiglitazon erhöhtes Risiko: Myokardinfarkt (RR 1.4); kardiovask.-Mortalität (RR 1.6) nicht empfehlenswert The nasal route of administration The nasal route represents a highly effective means of drug delivery. Intranasal drug absorption is facilitated by the highly vascularized, microvillous nature of the nasal mucosa, which provides an absorption surface estimated at 160 cm2. Each cell has about cilia and there are microvilli between the cilia which greatly increase the surface for absorption. They are covered by an hydrophilic mucus whose outer layer is relatively viscous and moves over the surface of the cilia. This mucus will trap dust and bacteria. The cilia beat with a powerful forward stroke and this rhythmic activity is responsible for the mucociliary clearance. Any drug deposited locally is therefore moved posteriorly, this antero-posterior transit time allowing local absorption, the non absorbed fraction being swallowed. Beneath the mucosa lies a complex vascular system including erectile tissue composed of sinusoids under autonomic nervous control which rapidly convey any substances absorbed across the epithelium into the systemic blood stream. Thus the absorption of drugs via a nasal route may be dependent upon the patency of the nasal airway, the retention of the drug on the mucosal surface, the mucociliary clearance function and the vascularity of the nasal mucosa. Hydrophilic substances dissolve rapidly and diffuse to the highly vascular cell lining from where they are absorbed into the general circulation. The bioavailability of a drug is also affected by factors related to the drug itself, such as molecular size and lipophilicity, and those related to the drug vehicle. Preliminary clinical experiences have documented that this route is appropriate for estrogen. The lining of the nasal cavity, showing little in the way of enzymatic function, is particularly well adapted to the absorption of products, such as estradiol, which are subjected to considerable intestinal metabolism when given orally. The nasal route is already being used with success for certain other long-term therapies eg, LHRH agonists and calcitonin. Other drugs such as insulin, vaccines, and nicotine compounds are currently under development for intranasal use. 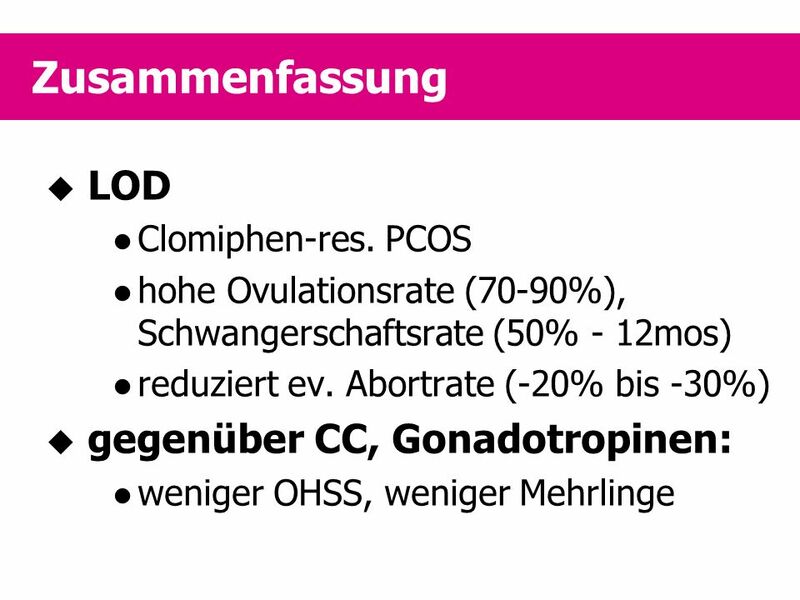 25 Langzeiteffekte MET PCOS – erhöhtes Risiko DM II, early-onset cardiovascular disease (Pierpont 1998) MET verbessert Risikofaktoren CVD keine klinischen Endpunktstudien Lipidprofil: Chol. 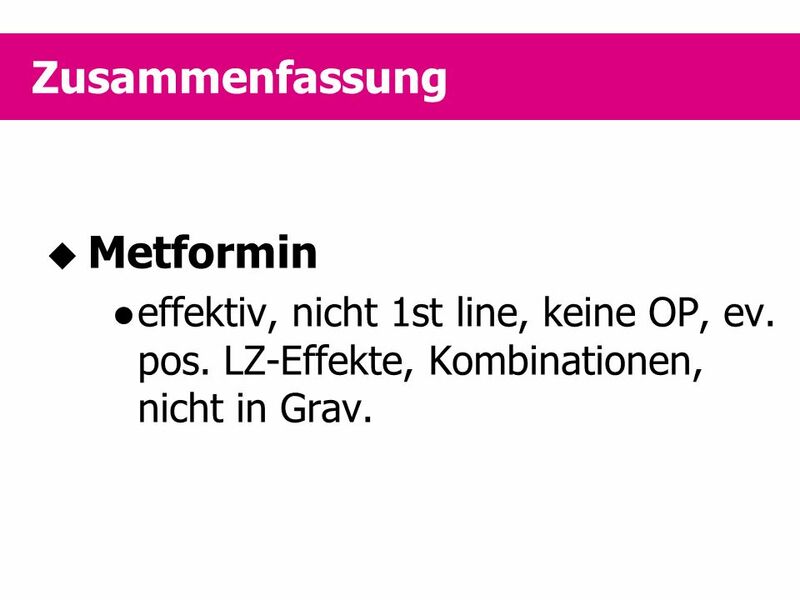 LDL, Trigl. 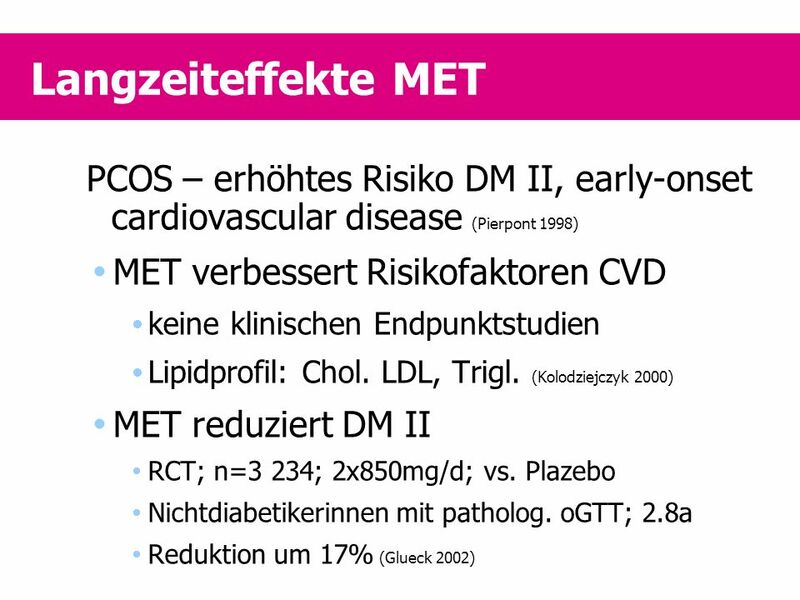 (Kolodziejczyk 2000) MET reduziert DM II RCT; n=3 234; 2x850mg/d; vs. Plazebo Nichtdiabetikerinnen mit patholog. oGTT; 2.8a Reduktion um 17% (Glueck 2002) The nasal route of administration The nasal route represents a highly effective means of drug delivery. Intranasal drug absorption is facilitated by the highly vascularized, microvillous nature of the nasal mucosa, which provides an absorption surface estimated at 160 cm2. Each cell has about cilia and there are microvilli between the cilia which greatly increase the surface for absorption. They are covered by an hydrophilic mucus whose outer layer is relatively viscous and moves over the surface of the cilia. This mucus will trap dust and bacteria. The cilia beat with a powerful forward stroke and this rhythmic activity is responsible for the mucociliary clearance. Any drug deposited locally is therefore moved posteriorly, this antero-posterior transit time allowing local absorption, the non absorbed fraction being swallowed. Beneath the mucosa lies a complex vascular system including erectile tissue composed of sinusoids under autonomic nervous control which rapidly convey any substances absorbed across the epithelium into the systemic blood stream. Thus the absorption of drugs via a nasal route may be dependent upon the patency of the nasal airway, the retention of the drug on the mucosal surface, the mucociliary clearance function and the vascularity of the nasal mucosa. Hydrophilic substances dissolve rapidly and diffuse to the highly vascular cell lining from where they are absorbed into the general circulation. The bioavailability of a drug is also affected by factors related to the drug itself, such as molecular size and lipophilicity, and those related to the drug vehicle. Preliminary clinical experiences have documented that this route is appropriate for estrogen. The lining of the nasal cavity, showing little in the way of enzymatic function, is particularly well adapted to the absorption of products, such as estradiol, which are subjected to considerable intestinal metabolism when given orally. The nasal route is already being used with success for certain other long-term therapies eg, LHRH agonists and calcitonin. Other drugs such as insulin, vaccines, and nicotine compounds are currently under development for intranasal use. 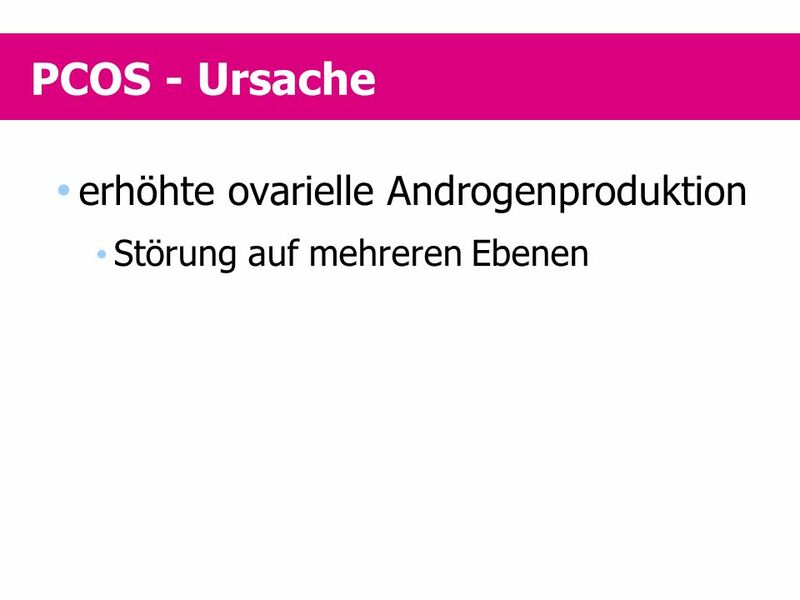 keine randomisierte Studie ovulation rates, pregnancy rates gleich beide: weniger OHSS, multiples; MET: no surgery The nasal route of administration The nasal route represents a highly effective means of drug delivery. Intranasal drug absorption is facilitated by the highly vascularized, microvillous nature of the nasal mucosa, which provides an absorption surface estimated at 160 cm2. Each cell has about cilia and there are microvilli between the cilia which greatly increase the surface for absorption. They are covered by an hydrophilic mucus whose outer layer is relatively viscous and moves over the surface of the cilia. This mucus will trap dust and bacteria. The cilia beat with a powerful forward stroke and this rhythmic activity is responsible for the mucociliary clearance. Any drug deposited locally is therefore moved posteriorly, this antero-posterior transit time allowing local absorption, the non absorbed fraction being swallowed. Beneath the mucosa lies a complex vascular system including erectile tissue composed of sinusoids under autonomic nervous control which rapidly convey any substances absorbed across the epithelium into the systemic blood stream. Thus the absorption of drugs via a nasal route may be dependent upon the patency of the nasal airway, the retention of the drug on the mucosal surface, the mucociliary clearance function and the vascularity of the nasal mucosa. Hydrophilic substances dissolve rapidly and diffuse to the highly vascular cell lining from where they are absorbed into the general circulation. The bioavailability of a drug is also affected by factors related to the drug itself, such as molecular size and lipophilicity, and those related to the drug vehicle. Preliminary clinical experiences have documented that this route is appropriate for estrogen. The lining of the nasal cavity, showing little in the way of enzymatic function, is particularly well adapted to the absorption of products, such as estradiol, which are subjected to considerable intestinal metabolism when given orally. The nasal route is already being used with success for certain other long-term therapies eg, LHRH agonists and calcitonin. Other drugs such as insulin, vaccines, and nicotine compounds are currently under development for intranasal use. The nasal route represents a highly effective means of drug delivery. Intranasal drug absorption is facilitated by the highly vascularized, microvillous nature of the nasal mucosa, which provides an absorption surface estimated at 160 cm2. Each cell has about cilia and there are microvilli between the cilia which greatly increase the surface for absorption. They are covered by an hydrophilic mucus whose outer layer is relatively viscous and moves over the surface of the cilia. This mucus will trap dust and bacteria. The cilia beat with a powerful forward stroke and this rhythmic activity is responsible for the mucociliary clearance. Any drug deposited locally is therefore moved posteriorly, this antero-posterior transit time allowing local absorption, the non absorbed fraction being swallowed. Beneath the mucosa lies a complex vascular system including erectile tissue composed of sinusoids under autonomic nervous control which rapidly convey any substances absorbed across the epithelium into the systemic blood stream. Thus the absorption of drugs via a nasal route may be dependent upon the patency of the nasal airway, the retention of the drug on the mucosal surface, the mucociliary clearance function and the vascularity of the nasal mucosa. Hydrophilic substances dissolve rapidly and diffuse to the highly vascular cell lining from where they are absorbed into the general circulation. The bioavailability of a drug is also affected by factors related to the drug itself, such as molecular size and lipophilicity, and those related to the drug vehicle. Preliminary clinical experiences have documented that this route is appropriate for estrogen. The lining of the nasal cavity, showing little in the way of enzymatic function, is particularly well adapted to the absorption of products, such as estradiol, which are subjected to considerable intestinal metabolism when given orally. The nasal route is already being used with success for certain other long-term therapies eg, LHRH agonists and calcitonin. Other drugs such as insulin, vaccines, and nicotine compounds are currently under development for intranasal use. 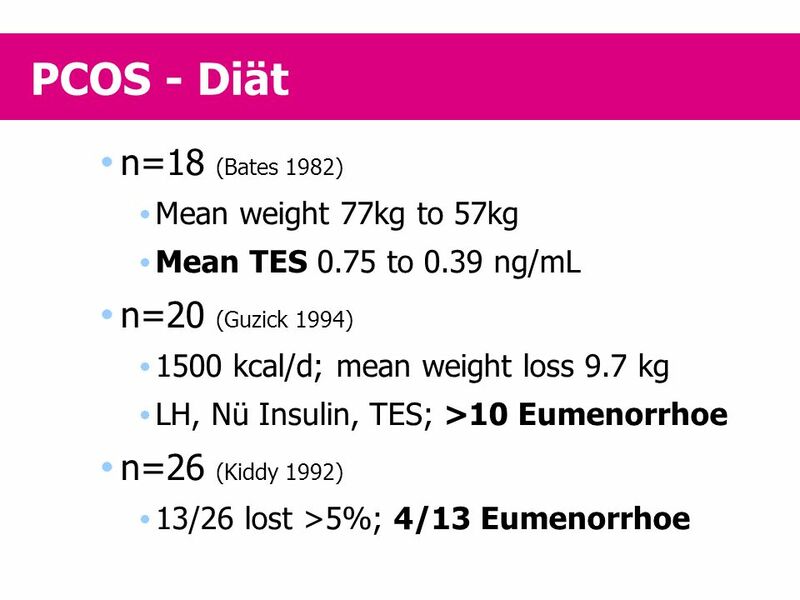 Mean weight 77kg to 57kg Mean TES 0.75 to 0.39 ng/mL n=20 (Guzick 1994) 1500 kcal/d; mean weight loss 9.7 kg LH, Nü Insulin, TES; >10 Eumenorrhoe n=26 (Kiddy 1992) 13/26 lost >5%; 4/13 Eumenorrhoe The nasal route of administration The nasal route represents a highly effective means of drug delivery. Intranasal drug absorption is facilitated by the highly vascularized, microvillous nature of the nasal mucosa, which provides an absorption surface estimated at 160 cm2. Each cell has about cilia and there are microvilli between the cilia which greatly increase the surface for absorption. They are covered by an hydrophilic mucus whose outer layer is relatively viscous and moves over the surface of the cilia. This mucus will trap dust and bacteria. The cilia beat with a powerful forward stroke and this rhythmic activity is responsible for the mucociliary clearance. Any drug deposited locally is therefore moved posteriorly, this antero-posterior transit time allowing local absorption, the non absorbed fraction being swallowed. Beneath the mucosa lies a complex vascular system including erectile tissue composed of sinusoids under autonomic nervous control which rapidly convey any substances absorbed across the epithelium into the systemic blood stream. Thus the absorption of drugs via a nasal route may be dependent upon the patency of the nasal airway, the retention of the drug on the mucosal surface, the mucociliary clearance function and the vascularity of the nasal mucosa. Hydrophilic substances dissolve rapidly and diffuse to the highly vascular cell lining from where they are absorbed into the general circulation. The bioavailability of a drug is also affected by factors related to the drug itself, such as molecular size and lipophilicity, and those related to the drug vehicle. Preliminary clinical experiences have documented that this route is appropriate for estrogen. The lining of the nasal cavity, showing little in the way of enzymatic function, is particularly well adapted to the absorption of products, such as estradiol, which are subjected to considerable intestinal metabolism when given orally. The nasal route is already being used with success for certain other long-term therapies eg, LHRH agonists and calcitonin. Other drugs such as insulin, vaccines, and nicotine compounds are currently under development for intranasal use. 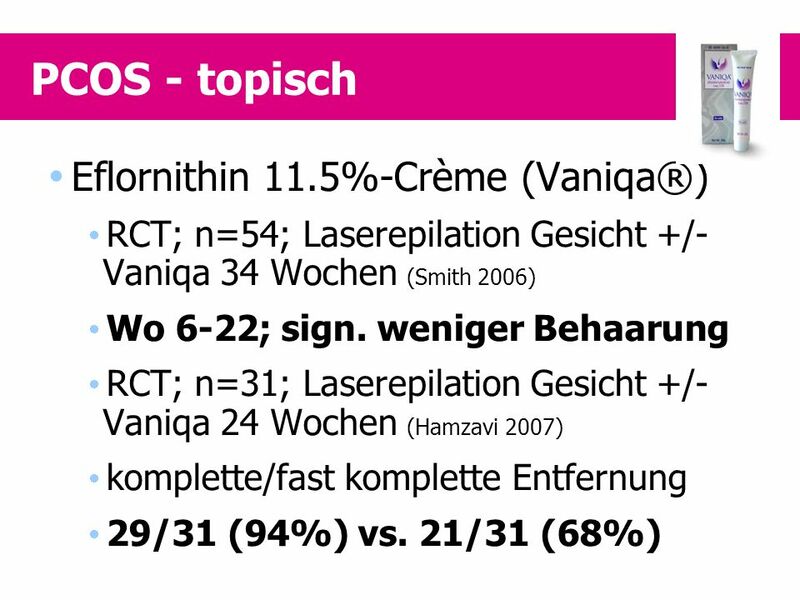 RCT; n=54; Laserepilation Gesicht +/- Vaniqa 34 Wochen (Smith 2006) Wo 6-22; sign. weniger Behaarung RCT; n=31; Laserepilation Gesicht +/- Vaniqa 24 Wochen (Hamzavi 2007) komplette/fast komplette Entfernung 29/31 (94%) vs. 21/31 (68%) The nasal route of administration The nasal route represents a highly effective means of drug delivery. Intranasal drug absorption is facilitated by the highly vascularized, microvillous nature of the nasal mucosa, which provides an absorption surface estimated at 160 cm2. Each cell has about cilia and there are microvilli between the cilia which greatly increase the surface for absorption. They are covered by an hydrophilic mucus whose outer layer is relatively viscous and moves over the surface of the cilia. This mucus will trap dust and bacteria. The cilia beat with a powerful forward stroke and this rhythmic activity is responsible for the mucociliary clearance. Any drug deposited locally is therefore moved posteriorly, this antero-posterior transit time allowing local absorption, the non absorbed fraction being swallowed. Beneath the mucosa lies a complex vascular system including erectile tissue composed of sinusoids under autonomic nervous control which rapidly convey any substances absorbed across the epithelium into the systemic blood stream. Thus the absorption of drugs via a nasal route may be dependent upon the patency of the nasal airway, the retention of the drug on the mucosal surface, the mucociliary clearance function and the vascularity of the nasal mucosa. Hydrophilic substances dissolve rapidly and diffuse to the highly vascular cell lining from where they are absorbed into the general circulation. The bioavailability of a drug is also affected by factors related to the drug itself, such as molecular size and lipophilicity, and those related to the drug vehicle. Preliminary clinical experiences have documented that this route is appropriate for estrogen. The lining of the nasal cavity, showing little in the way of enzymatic function, is particularly well adapted to the absorption of products, such as estradiol, which are subjected to considerable intestinal metabolism when given orally. 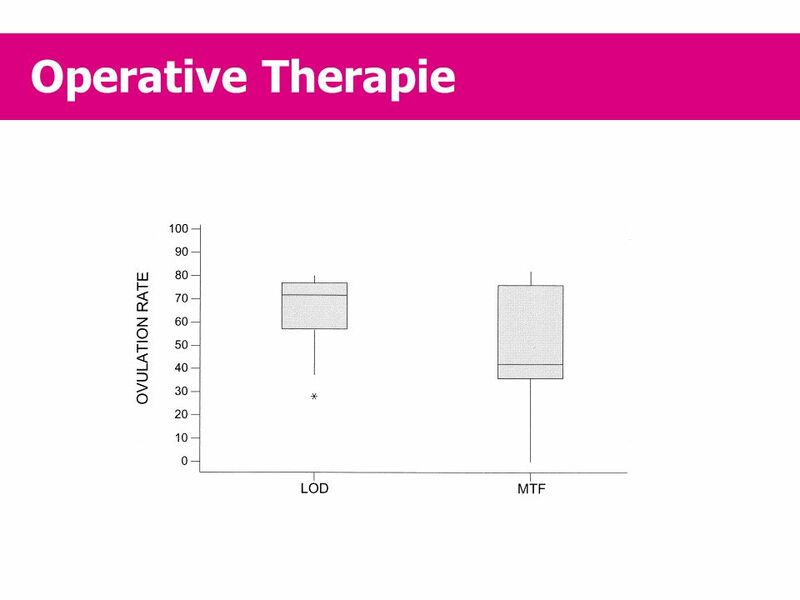 The nasal route is already being used with success for certain other long-term therapies eg, LHRH agonists and calcitonin. Other drugs such as insulin, vaccines, and nicotine compounds are currently under development for intranasal use. 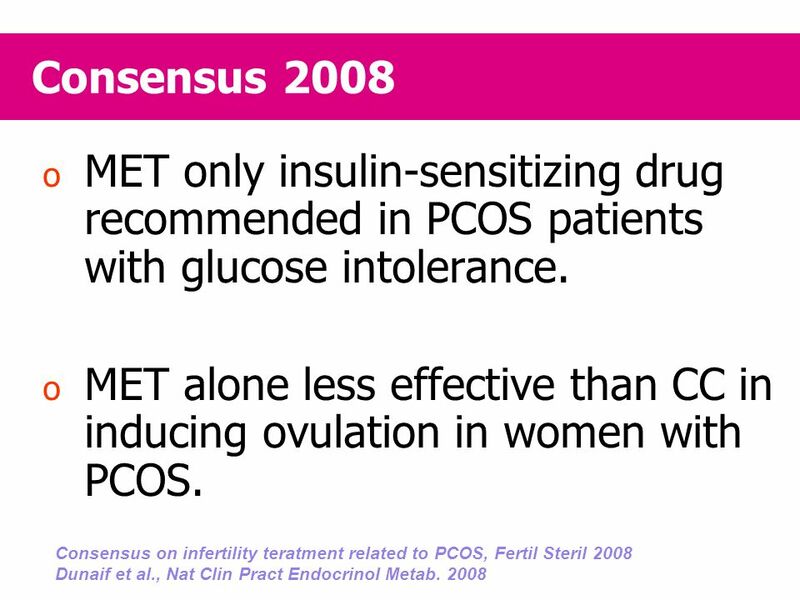 MET restricted to women with glucose intolerance. 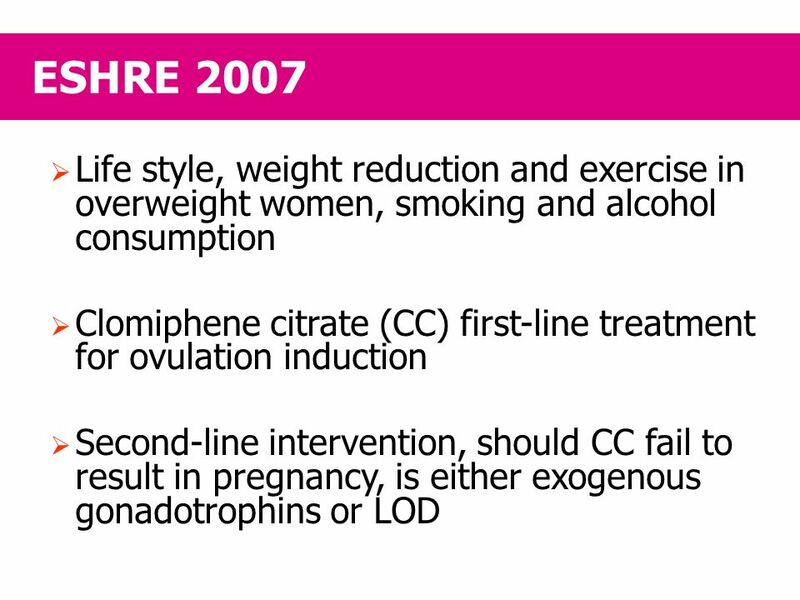 Routine use for ovulation induction not recommended. 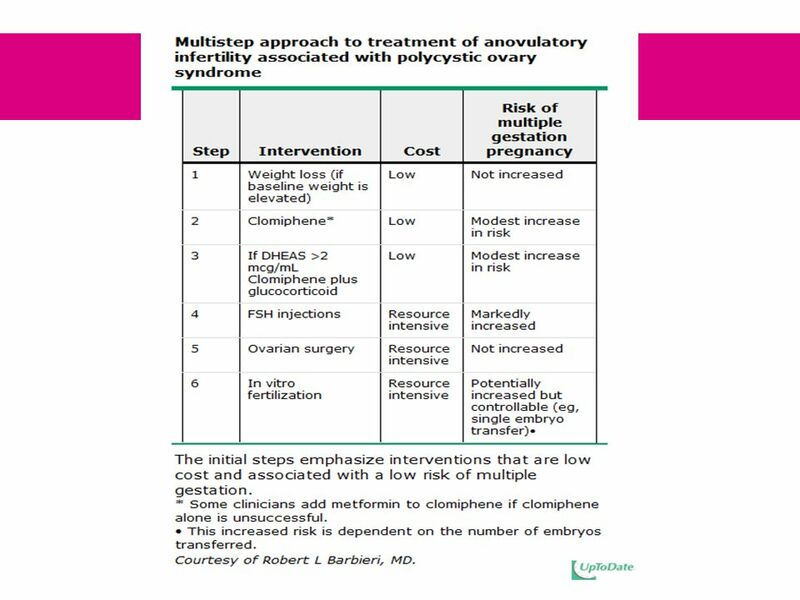 Even singleton pregnancies in PCOS are associated with increased health risk for both the mother and the fetus. 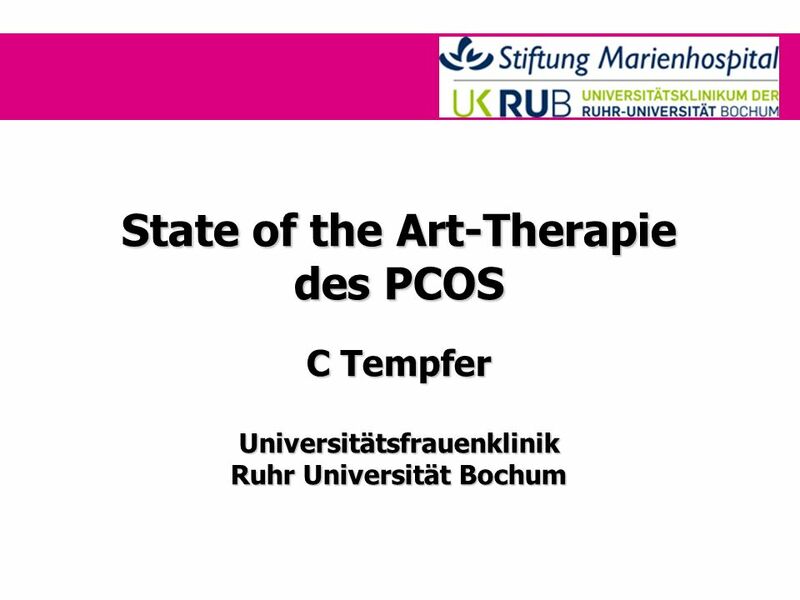 Herunterladen ppt "State of the Art-Therapie des PCOS"